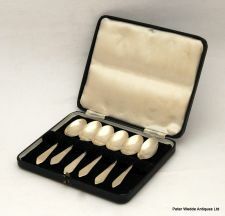 A Good Victorian Oak Cased 5 Piece Antler Handle Carving Set With Sterling Silver Terminals And Ferrules. The Case In Good Condition Notwithstanding A Slightly Shabby Interior, The Utensils In Excellent Condition, The Knives Need A Good Steel. Mappin & Webb is a true British treasure with over 241 years of tradition and historical significance in the world of silver and jewellery. Renowned for combining timeless craftsmanship with superior quality and contemporary design, for over two centuries we have produced exquisite jewellery, elegant silverware, watches, glassware and the unique lifestyle accessories that have long been at the heart of affluent British society. 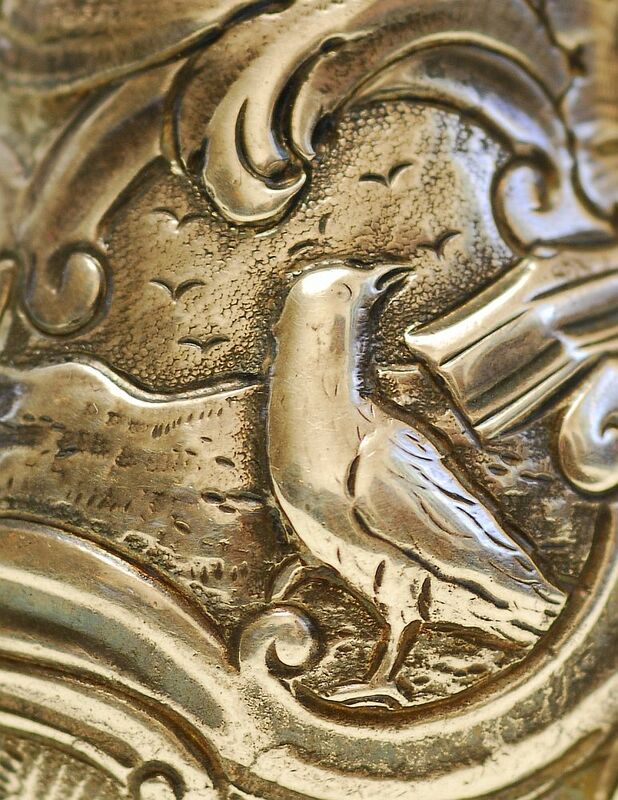 It's a story that began in 1775, when Jonathan Mappin opened a silver workshop in Sheffield with a vision to create the most beautifully crafted silverware. It would see the company expand internationally, receive royal warrants and commissions from Monarchs around the world, and become synonymous with excellence, craftsmanship and all things truly greatly British. A Delightful Pair Of Small Circular Sterling Silver Picture Frames Engraved With "Concorde;" Blue Velvet Easels And Backs. Perfect Present For A Man With An Aeronautical Bent, Mint Condition. 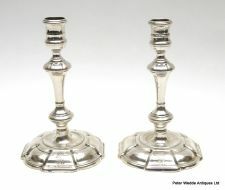 A Decorative Pair Of Sterling Silver Menu Holders Modelled As Grenadier Guards Type Flaming Grenades On Spreading Feet. 51mm High x 69mm Wide. A Good Looking Scottish Style Arts And Crafts Sterling Silver Mounted Turned Mahogany Circular Mazer. The Silver Rim With A Few Small Wrinkles, Otherwise Pretty Good Condition. 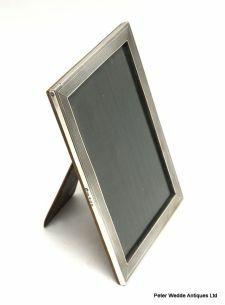 An Attractive Edwardian Plain Rectangular Sterling Silver Picture Frame With Original Oak Easel. 220mm High x 116mm Wide. Excellent Condition, Perfect Size For Full Length Bride & Groom. 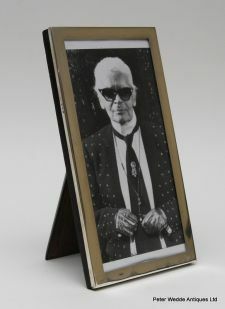 A Very Large Plain Rectangular Sterling Silver Picture Frame With Original Ebonised Oak Back And Easel. 320mm High x 256mm Wide. A Good Looking George III Large Sterling Silver Helmet Shape Cream Jug With Reeded Handle And Edge, Bright Cut Engraved Rim, Escutcheon Monogramed "JWV" And Square Base. 145mm High To Top Of Handle. Excellent Condition With Very Clear Marks. 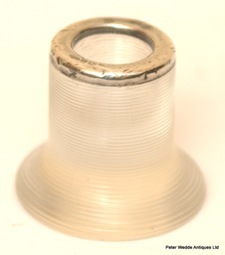 A Cased Plain Sterling Silver Serviette Ring With Rolled Edge; Probably NZ Made, Stamped ST SILVER. This Is Very Heavy In The Hand, Perfect Christening Present. 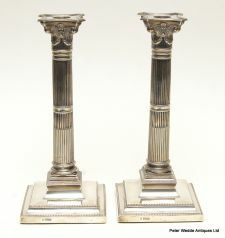 A Splendid Pair Of Edwardian Sterling Silver Corinthian Column Candlesticks With Detachable Sconces, Fluted Columns And Plain Stepped And Beaded Bases; Baized, Loaded. Pretty Good Condition, Nice Clear Marks, Some Minor Wrinkling On The Bottom Straight Side Of The Bases, Crucially There Are No Polish Holes Where Zealous Cleaning In The Past Has Worn Through The High Points - A Common Defect With Candlesticks Of This Type, Not This Pair - No Polish Holes At All, Just The Right Size For The Dining Table, Not Too Big, Not Too Small, Just Right. 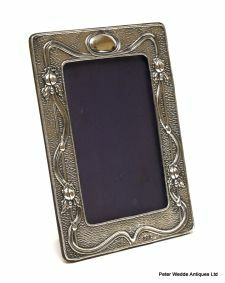 A Sterling Silver Art Nouveau Rectangular Picture Frame With Blank Cartouche And Curvilinear Foliate Tendrils On A Basket Weave Ground. 141mm Wide x 185mm High. The Easel Functional But A Bit Tired, The Silver Good With Minor Dents, The Marks Clear. 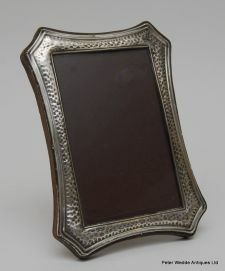 A George V Early 20thC Shaped Rectangular Sterling Silver Picture Frame With Wrought Edge And Original Oak Easel. 125mm Wide x 177mm High. 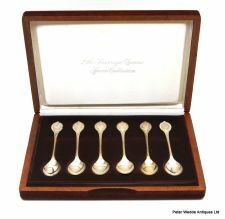 A Cased Set Of 6 Commemorative Sterling Silver Spoons, The Sovereign Queens Spoon Collection, Made To Commemorate The Silver Jubilee Of Queen Elizabeth II, Featuring Mary I, Elizabeth I, Mary II, Anne, Victoria And Elizabeth II. A Very Stylish Art Deco Plain Engine Turned Rectangular Photograph Frame With Original Oak Easel. 202mm High x 151mm Wide. 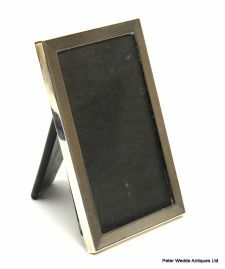 A Very Stylish Art Deco Plain Engine Turned Rectangular Photograph Frame With Original Ebonised Easel. Sanders & Mackenzie, Birmingham 1958. 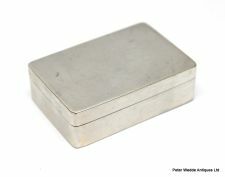 A Very Smart Small Victorian Sterling Silver Four Division Cheroot Case Of Shaped Rectangular Form With Engine Turned Decoration: Monogramed "RD." 87mm Wide x 52mm Deep. 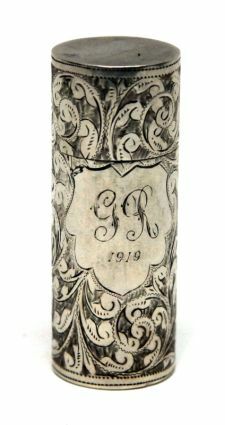 Excellent Condition, One Would Have To Say A Perfect Joint Case, With A Monogram Like That The Perfect Gift For A Bucolic Gentleman. A Pair Of Late Victorian Sterling Silver Sugar Tongs With Bright Cut Engraving. 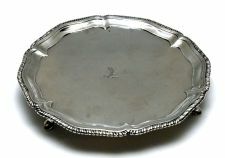 A Good Looking Elizabeth II Georgian Style Sterling Silver Shaped Circular Salver With Corded Edge And Four Talon And Ball Feet. 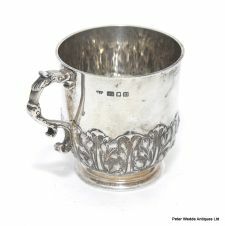 An Attractive George III Sterling Silver Baluster Half Pint Mug With Gilded Interior, Acanthus Capped Double Scroll Handle, Stepped Circular Foot, Foliate Engraved Rim And Blank Rococo Cartouche. A Smart Pair Of Victorian Georgian Style EPNS Tall Candlesticks With Detachable Sconces, Double Knopped Stems And Shaped Stepped Bases. Marks For Elkington & Co., 1854. 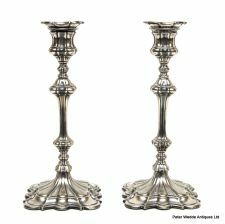 Bases Baized, Good Condition With The Bonus Of A Top Maker - Get The Look For A Fraction Of The Price - I've Just Sold A Pair Of Georgian Period Cast Sterling Silver Candlesticks For $5,000 - To The Untrained Eye This Pair At $380 Would Have Looked Similar. 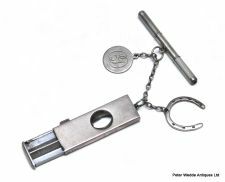 A Gentlemans Continental Engine Turned Silver Cigar Cutter On Chain With Sterling Silver Horseshoe Fob, Disc Monogramed "CD" And Propelling Sterling Silver Tooth Pick. Weight : 42 Grams All In. 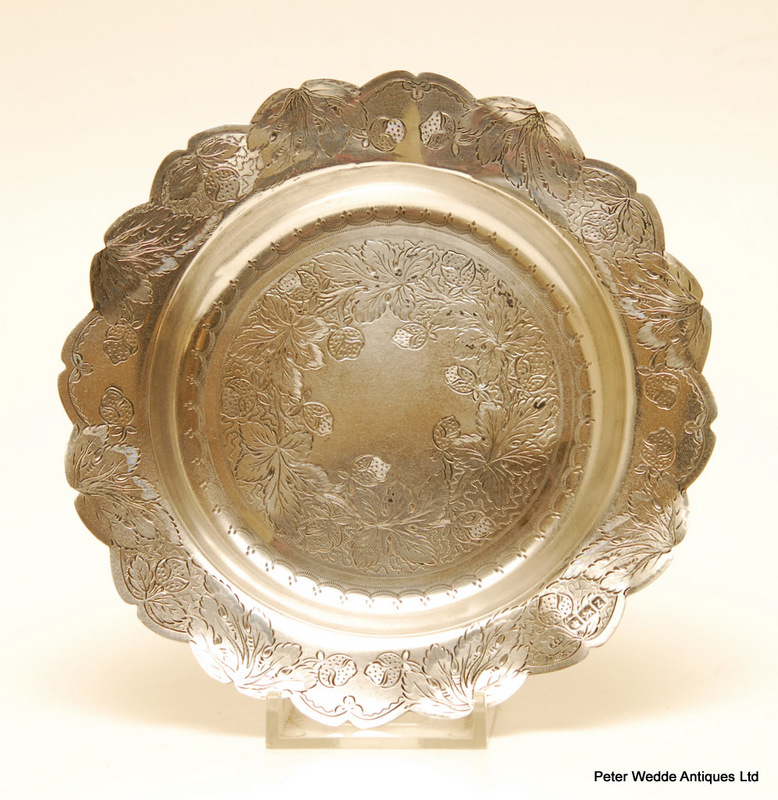 An Impressive American Sterling Standard Oval Centrepiece With Shaped Oval Rim Pierced And Engraved With Poppies, The Centre Monogramed, Raised On A Squat Pedestal And Oval Base. This Is A Large And Impressive Piece Of Silver In Immaculate Condition. 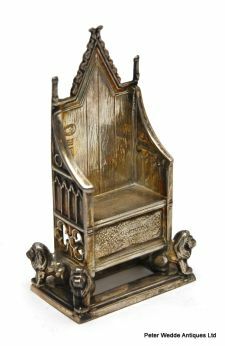 A Cased Sterling Silver Throne, Showing Aperture For The Stone Of Scone, Made To Commemorate The Coronation Of Queen Elizabeth II. 40mm Wide x 23mm Deep x 72mm High. The Stone of Scone —also known as the Stone of Destiny, and often referred to in England as The Coronation Stone—is an oblong block of red sandstone that was used for centuries in the coronation of the monarchs of Scotland, and later the monarchs of England and the Kingdom of Great Britain. Historically, the artefact was kept at the now-ruined Scone Abbey in Scone, near Perth, Scotland. It is also known as Jacob's Pillow Stone and the Tanist Stone, and in Scottish Gaelic, clach-na-cinneamhain. Its size is about 26 inches (660 mm) by 16.75 inches (425 mm) by 10.5 inches (270 mm) and its weight is approximately 336 pounds (152 kg). A roughly incised cross is on one surface, and an iron ring at each end aids with transport. The Stone of Scone was last used in 1953 for the coronation of Elizabeth II of the United Kingdom of Great Britain and Northern Ireland. On Christmas Day 1950, a group of four Scottish students (Ian Hamilton, Gavin Vernon, Kay Matheson, and Alan Stuart) removed the stone from Westminster Abbey for return to Scotland. During the removal process, the stone broke into two pieces. After burying the greater part of the Stone in a Kent field, where they camped for a few days, they uncovered the buried stone and returned to Scotland, along with a new accomplice, John Josselyn. According to one US diplomat who was posted in Edinburgh at the time, the stone was hidden for a short time in a trunk in the basement of the Consulate's Public Affairs Officer, unknown to him, before it was removed. Although English, Josselyn, who was then a student at the University of Glasgow, was a Scottish Nationalist. Edward I was Josselyn's 21st great-grandfather.The smaller piece was similarly brought north at a later time. The entire stone was passed to a senior Glasgow politician, who arranged for it to be professionally repaired by Glasgow stonemason Robert Gray. In 1996, in a symbolic response to growing dissatisfaction among Scots at the prevailing constitutional settlement, the British Conservative Government decided that the stone should be kept in Scotland when not in use at coronations. On 3 July 1996, it was announced in the House of Commons that the stone would be returned to Scotland, and on 15 November 1996, after a handover ceremony at the border between representatives of the Home Office and of the Scottish Office, it was transported to Edinburgh Castle. The stone arrived in the Castle on 30 November 1996 and it remains alongside the crown jewels of Scotland (the Honours of Scotland) in the Crown Room. The handover occurred on St Andrew's Day, a day in honour of the patron Saint of Scotland, and Prince Andrew, Duke of York was the Queen's representative. 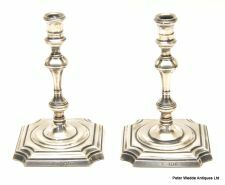 A Pair Of George II Cast Sterling Silver Mullti-Knop Candlesticks With Sunken Wells And Domed Octagonal Bases; Engraved Crest Of A Demi Lion Surmounted By A Coronet. Good Condition, Good Clear Marks. A Splendid George II Sterling Silver Girdled Plain Baluster Tankard With Double Domed Hinged Cover, Chair Back Thumbpiece, Double Scroll Handle With Heart Terminal And Spreading Circular Foot. 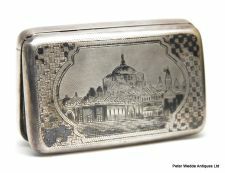 A 19thC Russian Niello Silver Snuff Box Of Rounded Rectangular Form Decorated With A Domed Russian Orthordox Church. 106mm Wide x 66mm Deep x 27mm High. Typical Russian Hallmarks, Possibly Tiflis, 1884. 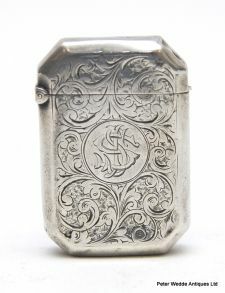 A Large Late Victorian Sterling Silver Table Snuff Box Of Waisted Rectangular Form, The Engine Turned Cover Centred With A Monogram Within A Rococo Foliate Scroll Cartouche. 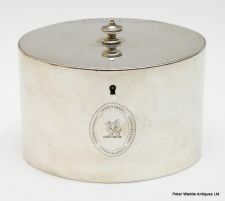 A Rare George III Plain Oval Sterling Silver Tea Caddy With Urn Form Finial, Flat Lid, Flush Hinge, Lock And Engraved Armorial Of A Griffin Within A Leaf Framed Cartouche. Charles Aldridge & Henry Green. 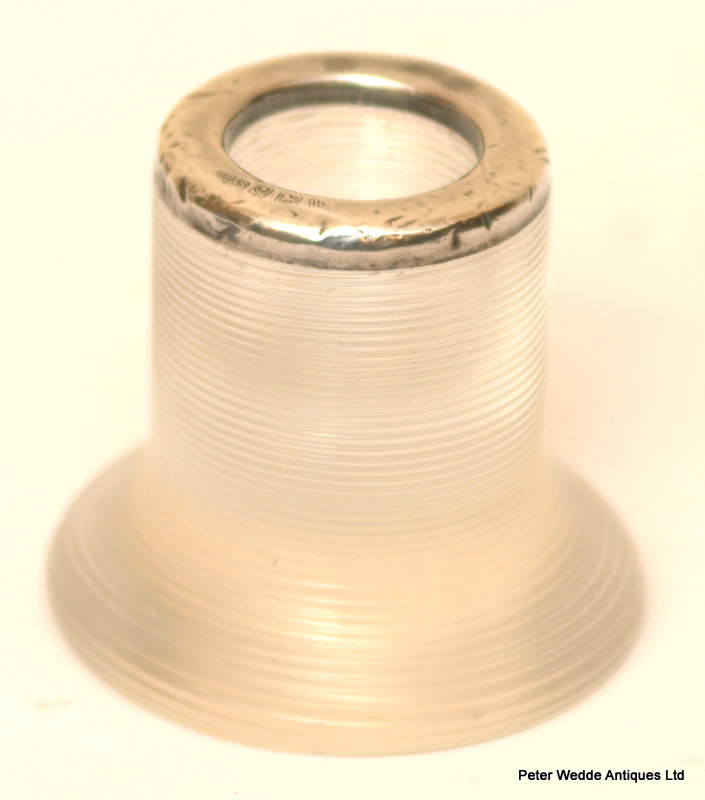 Crucially There Is No Damage To The Lock Or The Area Of Silver Surrounding The Lock - A Common Defect In Georgian Caddys. 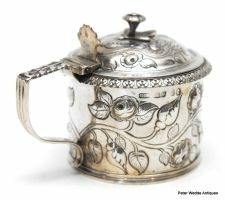 A Quality George V Charles II Style Sterling Silver Porringer With Relief Acanthus Work And Double Scroll Handles With Dolphin Terminals. Sebastian Henry Garrard - Garrard & Co.
Garrard & Co. Limited, formerly Asprey & Garrard Limited, designs and manufactures luxury jewellery and silver. George Wickes founded Garrard in London in 1735. Garrard is headquartered at Albemarle Street in Mayfair, London. Garrard also has a presence in Harrods, London, Geneva, Lebanon, Qatar, Dubai, Moscow and Hong Kong. Garrard was the Crown Jeweller of the UK, charged with the upkeep of the British Crown Jewels, from 1843 to 2007. The ICC Cricket World Cup Trophy was designed and produced in 1999 in London by a team of craftsmen from Garrard & Co.
A George II Sterling Silver Taperstick With Octagonal Stem, Sunken Well Shaped Ocatonal Base And Engraved Upright Lion Crest; Later Sconce. 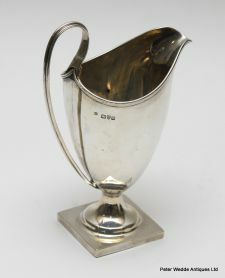 An Edwardian Georgian Style Sterling Silver Pedestal Helmet Shape Cream Jug With Reeded Edge And Handle And Square Base. 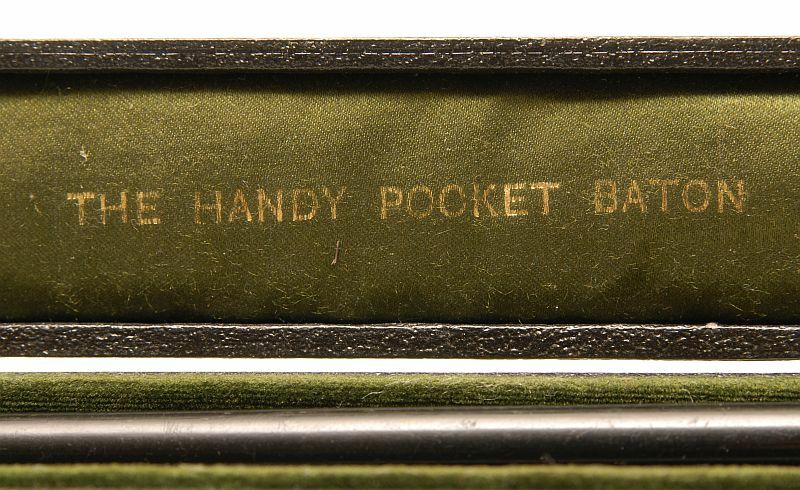 An Early 20thC German 800 Standard Rectangular Table Hinged Cigarette Case With Thumbpiece And Cedar Lining. 174mm Wide x 91mm Deep x 48mm High. The Cover With A Few Dings, OK Condition. A Lovely Plain Edwardian Sterling Silver Snuff Box Of Rectangular Form With Slightly Rounded Corners, Near Flush Hinge And Gilded Interior. Excellent Condition, Nice Weight, Great Plain Shape. 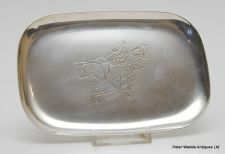 A Small Early 20thC Sterling Standard Rectangular Equestrian Tray With Rounded Corners And Upturned Rim, Engraved With Steeple Chase Jockeys And Horses. Unidentified Marks - Someone Willl Know What These Are. Excellent Condition, Nice And Weighty In The Hand, Obvious Appeal To Equestrians. 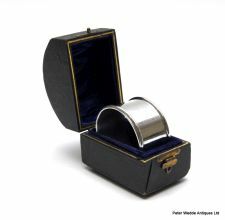 An Unusually Large George V Early 20thC Sterling Silver Plain Hip Shape Vesta Case With Suspension Ring. Excellent Condition With Gilded Interior. A George V Sterling Silver Engine Turned Vesta Case With Suspension Ring; Monogramed TOH? 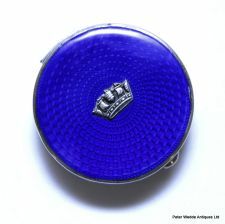 A Good George V Sterling Silver And Blue Guilloche Enamel Powder Compact Mounted With A Crown, The Interior With A Mirror. Good Condition, Lacks Puff, Make A Good Pill Box. A Quality Pair Of George V Early 20thC Dressing Table Vanity Jars With Faceted Glass And Sterling Silver Screw Covers. Asprey & Co., A Top London Bond Street Store. A George III Sterling Silver Oval Teapot Stand With Gadrooned Edge And Engraved Armorial Of A Lion And Cross; Cuban Mahogany Base. Excellent Condition With Good Patina. 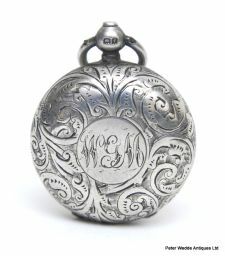 A Victorian Engraved Sterling Silver Vesta Case; Monogramed. A Few Dings, Crisp Action, Priced To Sell. 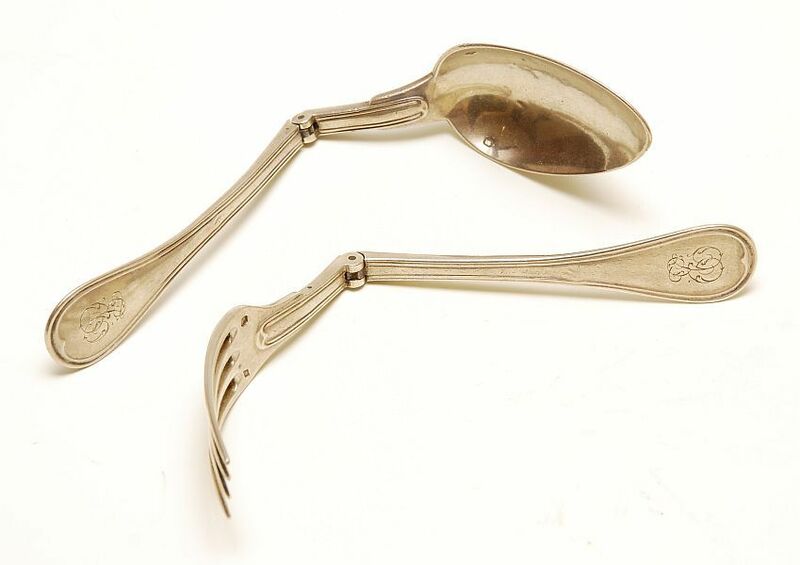 A Pair Of 19thC Provincial Sterling Silver Fiddle Pattern Soup Spoons. 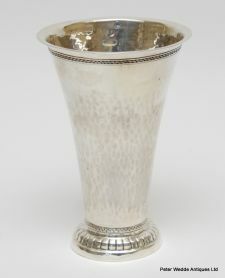 A Most Stylish Early 20thC Hand Wrought Sterling Silver Beaker Of Flaring Cylindrical Form With Circular Domed Foot. Bears Hanau, Berthold Mueller And Import Marks. 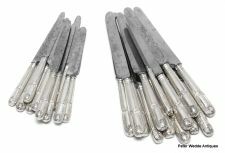 A Pair Of Georgian Style Sterling Silver Tapersticks With Multi-Knop Stems And Square Bases With Concave Corners; Loaded. A Cased Pair Of Waisted Sterling Silver Napkin Rings With Beaded Rims, Monogramed "AR" And "MC" Respectively. Excellent Condition, The Case Not Snapping Close And With A Bit Of Wear. A Victorian Sterling Silver Mounted Lady's Black Velvet Belt With Engine Turning, The Reverse Monogramed. 680mm Long x 38mm Wide. 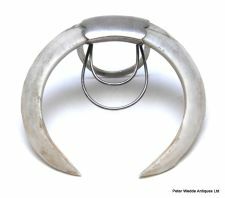 The Silver Links And Mounts Individually Hallmarked And In Good Condition, The Velvet A Little Worn, Very Wearable Altho Only Svelte Maidens Need Apply. 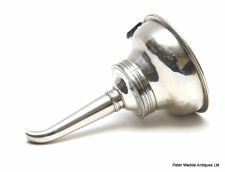 A George III Sterling Silver 2 Section Pierced Wine Funnel With Rolled Edge And Side Clip; Monogramed JO Over GEE, Both Pieces Hallmarked. 81mm Diameter x 124mm Long. Maker Not Identified, Possibly John Sanders. Good Condition, Tiny Split Appearing On Lower Half Flange Join. A Very Smart Set Of 4 19thC Georgian Style EPNS Telescopic Candlesticks With Garooned Edges And Domed Circular Bases. 174mm High Unextended & 214mm High Extended. Excellent Condition, Look Great On A Long Table Or Clustered, Always Good To Have 4 For High Decorative Impact. 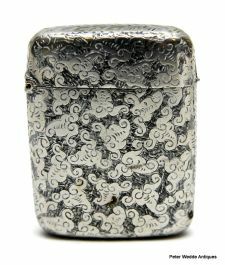 A Good Edwardian Sterling Silver Sovereign Case Decorated With Scroll Work. Excellent Condition, Crisp Snap Action, Original Colour. 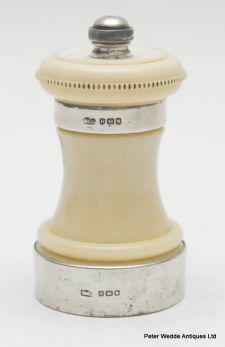 A Gorgeous Victorian Capstan Shape Ivory Pepper Mill With Nothced Rim And Sterling Silver Mounts. An Edwardian Cut Crystal Circular Dressing Table Bowl, The Domed Sterling Silver Cover Decorated In Relief With "Reynold's Angels." 77mm Diameter x 48mm High. S Blankensee & Son Ltd.
Good Condition With A Couple Of Minor Dings. 78mm Diameter x 41mm High. Good Condition With One Minor Rim Ding. 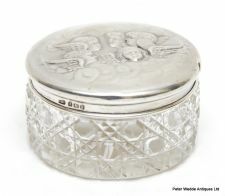 An Edwardian Oval Cut Crystal Dressing Table Box With Sterling Silver Cover Decorated In Relief With "Reynold's Angels." 136mm Wide x 42mm Deep x 40mm High. An Amusing Late Victorian Novelty Glass Claret Jug With Hinged Sterling Silver Mount Modelled As A Duck With Cut Red Glass Eyes, The Flattened Oviform Amber Glass Body With Simple Scroll Handle. John Thomas Heath & John Hartsghorne Middleton Of Hukin & Heath. The firm, active as manufacturing silversmiths and electroplaters, was established in Birmingham in 1855. In 1875 the firm entered its mark in Birmingham Assay Office, while in 1879 the founders Jonathan Wilson Hukin and John Thomas Heath entered their mark in London Assay Office. The firm was active at Imperial Works, Great Charles Street, Birmingham and in the showrooms at 19 Charterhouse Street, London. J.T. Hukin retired in 1881 and in 1886 J.T. Heath continued the partnership with John Hartsghorne Middleton. In 1904 the business was converted into a limited liability company under the style Hukin & Heath Ltd. The firm went out of business in 1953. 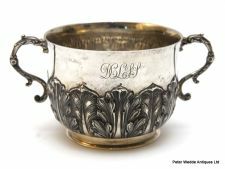 The firm is well known for its production in the 1870s and 1880s of silver and electroplated wares under the guidance of Dr. Christopher Dresser. 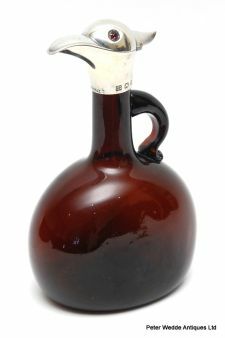 Novelty claret jugs were a speciality of the firm. 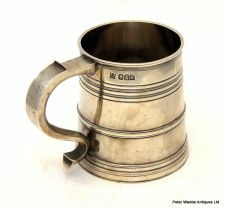 An Edwardian Georgian Style Britannia Standard Tapering Cylindrical Mug With Girdles And Plain Single Scroll Handle With Thumbiece, Monogramed GEHH. 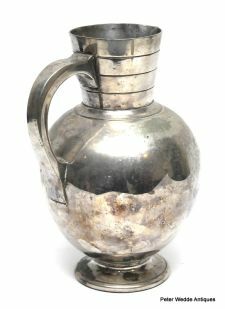 A George III Sterling Silver Helmet Shape Cream Jug With Engraved Greek Key Type Decoration With Flower Heads And Reeded Strap Handle; Monogramed "JHR." Would Like To Call PB Peter Bateman But It Appears He Is Only Recorded With His Sister And Brother And Does Not Have A Mark Of His Own? Whatever, In My Opinion This Is The Most Satisfying Of All Georgian Cream Jug Shapes, The Helmet With Generous Belly And Flat Base. A Pair Of George II Sterling Silver Cauldron Salts With Pad Feet And Blue Glass Liners; Engraved Under With Owners Initials For "SHM." 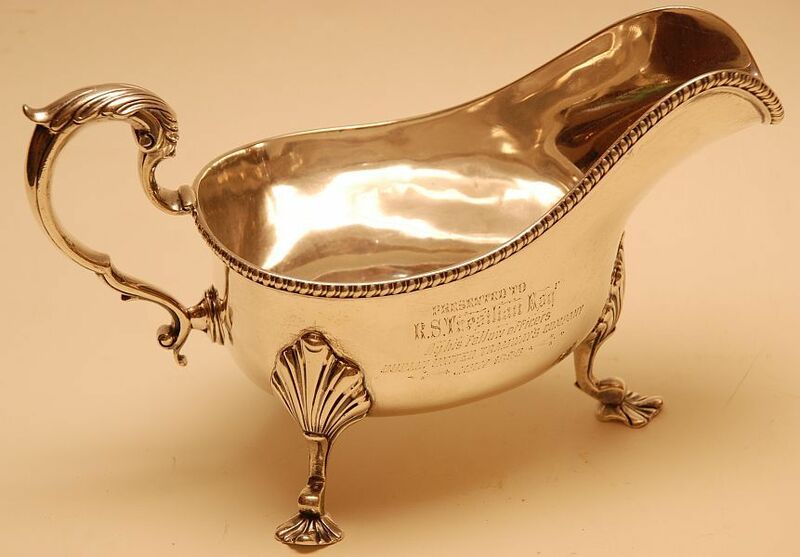 A Quality George V Sterling Silver Christening Mug With Cast Double Scroll Dolphin Handle And Applied Acanthus Leaves Above Domed Circular Foot; Monogramed "DCLSJ' And Inscribed To Base "Sally From Granddaddy And Grannie 25-1-29." 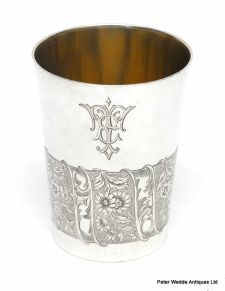 A 19thC German Silver Beaker With Gilded Interior, Engraved Monogram And Engraved Flowering Foliage. A Good Large Elizabeth II Sterling Silver Baluster Pepper Mill With "Peter Piper" Movement Dated 1982. 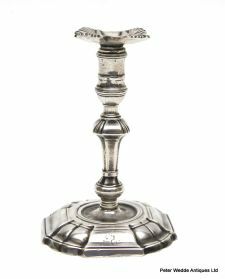 A Highly Decorative Victorian Sterling Silver Chamber Candlestick With Elaborate Medievil Revival Cast Handle And Circular Dish; Lacks Snuffer. 130mm Diameter x 246mm Across Handle. Stamped "Lambert Coventry St London." Excellent Condition, Satisfyingly Weighty In The Hand. George Lambert died on 12 September 1901 and quoting from his obituary "...was apprenticed to the Goldsmiths' Company in 1837, and filled the office of Prime Warden in 1887, of which circumstance he had a deep appreciation, as being the only apprentice who had attained that distinction for several centuries". 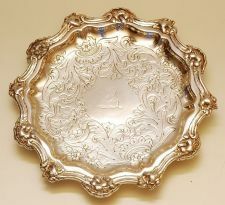 An Elizabeth II Sterling Silver Armada Dish Of Typical Shape With Scattered Hallmarks To The Rim. Monogramed Under TWW And Dated 1958-1968. Nice And Weighty In The Hand, Excellent Condition. Inspired By The Armada Service (alias Tudor Service) which is a set of more than 31 gilded silver dishes, dated between 1581 and 1601, formerly owned by Sir Christopher Harris (c. 1553–1625), MP, of Radford House in the parish of Plymstock in Devon, England. Twenty-six of these dishes are now in the collection of the British Museum in London. 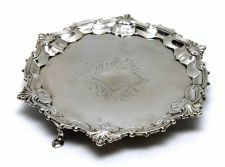 A Splendid Early 19thC Sheffield Plate Rectangular Entrée Dish And Cover With Cast Shell And Scroll Edges And Engraved Crest. 318mm Wide x 236mm Deep x 168mm High Including Handle. A Good Quality Regency Period Sheffield Plate Armorial Rectangular Vegetable Tureen And Cover With Detachable Handle, The Edge Gadrooned, The Rococo Scroll Cartouche Engraved With A Rooster And Cross Heraldic Device. 300mm Wide x 235mm Deep. A Large George V Sterling Silver Oval Capstan Inkwell With Hinged Cover And Original Glass Liner. 200mm Wide x 105mm Deep x 72mm High. A Rare Early 19thC Anglo-Indian Sterling Silver Brandy Sauce Pan Of Bellied Form With Domed Slip In Cover With Wood Finial, Hinged Spout Cover And Right Angle Turned Wood Handle. 132mm High x 122mm Wide Across Belly. Weight : 525 Grams All In. A Pair Of Victorian Queen Anne Style Sterling Silver Gilt Octagonal Trencher Salts. A George III Sterling Silver Circular Salver With Gadrooned Edge, Harebell Swags, Ball And Claw Feet And An Engraved Crest Of A Dragon. An Attractive And Weighty Small George V Georgian Style Square Waiter With Shaped Corners, Rolled Edge And Pad Feet. A 19thC Silver Mounted Tusk Decanter Label On Chain Engraved "Whiskey." 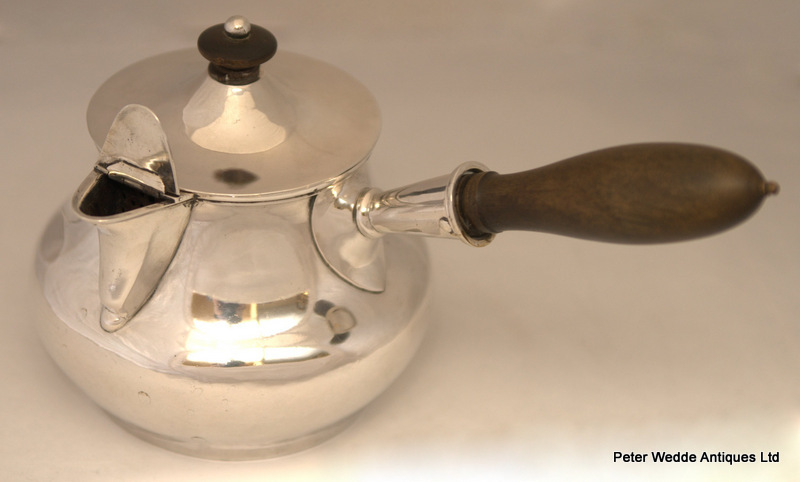 A Circular Sterling Silver Sugar Bowl With Girdle And Domed Foot. An Edwrdian Sterling Silver Plain Paper Knife With New Zealand Pounamu Cabochon Handle. "Frank Hyams LD 128 New Bond St. W"
A Good Large Eastern Silver Articulated Fish With Hinged Head And Cabochon Turquoise Glass Eyes. Good Condition, One Fin Lacking. 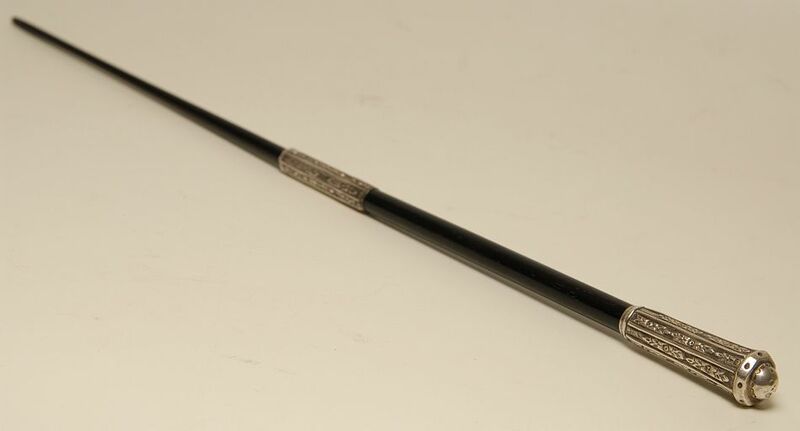 An Edwardian Ebony Conductors Baton With Sterling Silver Mounts. 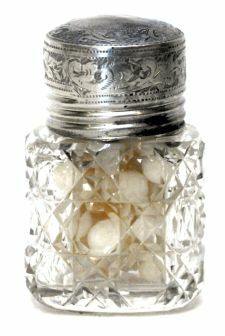 An Edwardian Glass Smelling Salts Jar With Star Cut Base, Silver Mounted Collar And Silver Mounted Stopper. The Silver A Bit Dinged, The Glass Cloudy. 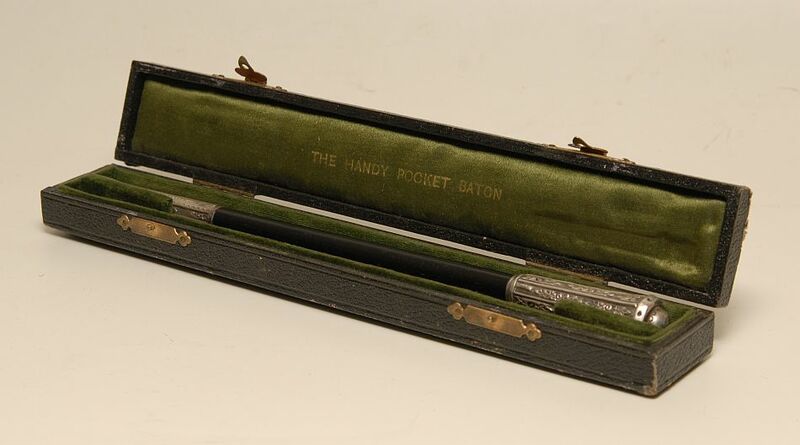 A Good Victorian Sterling Silver Propelling Pencil With Engine Turned And Scroll Work Barrel And Screw Cover Set With Monogrammed Agate. 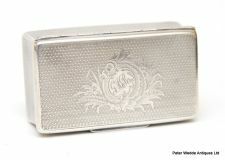 A George V Sterling Silver Capstan Shape Inkwell With Glass Liner, The Cover Inscribed "ESM 9 10 30." William Neale & Sons Ltd.
A Totally Gorgeous, Small And Elegant George III Sheffield Plate Helmet Shape Cream Jug With Ribbed Handle And Rim, Acanthus Terminal, Pedestal Foot And Slightly Domed Circular Foot. Seam Line Apparent, Excellent Condition, Charming In The Extreme. A Pair Of Early 20thC Cypriot 800 Standard Circular Bowls, Each With Armorial Device to The Well - A Double Headed Eagle And A Shield With Lion. Each Stamped "800" Together With Makers Device For "SG." 96mm Diameter x 35mm High. 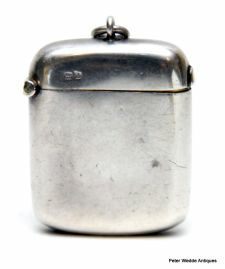 An Edwardian Sterling Silver Vesta Case Of Typical Form. 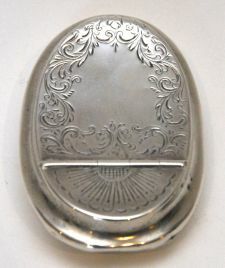 A Small Art Deco Hinged Sterling Silver Vanity Case. A Set Of 3 Small Early 20thC Cypriot 800 Standard Circular Bowls On Paw Feet, Each Decorated With An Armorial Panel Of A Double Headed Eagle. All Stamped "800" Together With "C Th Argyrides & Co."
80mm Diameter x 43mm High. An Early 19thC Close Plate Stilton Scoop With Turned Ivory Handle. A Superb George V Ribbed Oviform Glass Scent Bottle With Hinged Sterling Silver And Tortoiseshell Cover, Original Stopper And Inlaid Piquet Scrolling Harebell Ornament. 112mm Diameter x 83mm High. Excellent Condition, Nice And Weighty In The Hand. 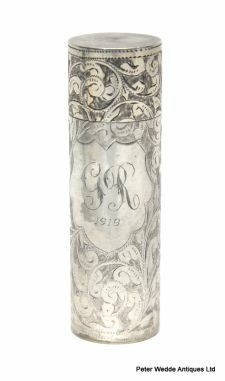 A Plain George III Sterling Silver Meat Skewer, Monogramed. George Smith III & William Fearn. The Tip A Bit Worn, Lovely Clear Marks. 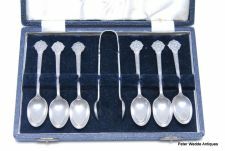 A Cased Set Of 6 Mid 20thC Australian Sterling Silver Teaspoons. Stamped "APW" And "Stg Silver." 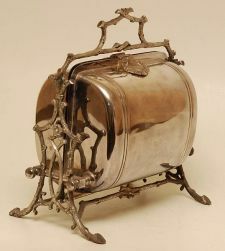 A Victorian Silver Mounted Double Tusk Menu Holder. A Small Sliver Missing From One Side, Otherwise Good Condition. A Pair Of Victorian Silver Mounted Tusk Decanter Labels On Chains For Sherry And Madeira. The Silver Not Marked, Circa 1860. A Single William IV Sterling Silver Fiddle Pattern Dessert Fork Engraved With An Eagle Crest. 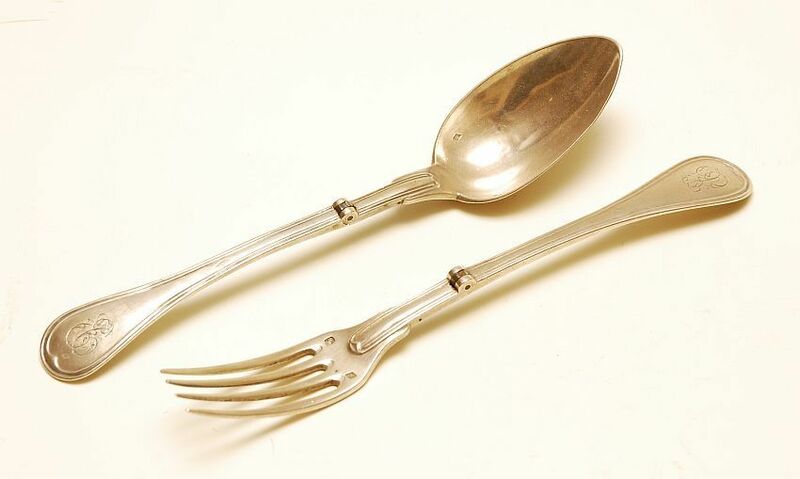 A Pair Of William IV Sterling Silver Fiddle Pattern Dessert Forks Engraved With A BeaverCrest Associated With The Coram Or Corham Family, Together With A Similar Fork Similarly Engraved. Total Weight : 155 Grams. A Victorian White Metal Engraved Vesta Case With Blank Shield Cartouche. 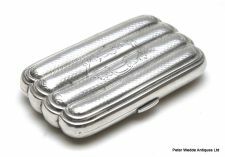 A Sterling Silver Cigarette Holder Case With Suspension Ring. A Set Of 7 Early 19thC EPNS Fiddle Pattern Table Forks Engraved With A Lion Crest Together With A Similar Set Of 6 Dessert Forks (1 Odd). 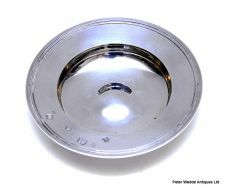 Your Guests Will Look At These And Think They Are Georgian Sterling Silver - Get The Look For A Token Sum. 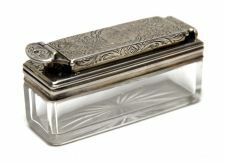 An Edwardian Sterling Silver Spectacle Case With Clip, Suspension Chain And Engraved Monogram "AJC." Weight : 76 Grams All In. Hallmarked On Both Pieces, Not Bad Condition, Couple Of Dings To The Bottom Of The Case. 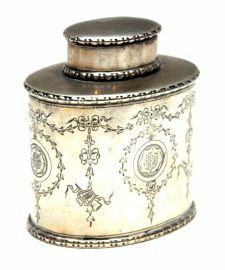 A Late Victorian Cylindrical Sterling Silver Cannister With Slip On Cover And All Over Engraved Scrollwork; Monogramed GR And Dated 1919. A Sterling Silver Caddy Spoon With Feathered Edge. 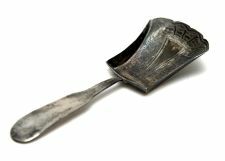 A George III Sterling Silver Shovel Shape Caddy Spoon, The Bowl With Shield Shape Cartouche: Monogramed EJ. Good Condition, Very Clear Marks. An Early Victorian Sterling Silver Fiddle Pattern Mustard Spoon; Monogramed MC? A George III Sterling Silver Bright Cut Teaspoon, Monogramed "B." 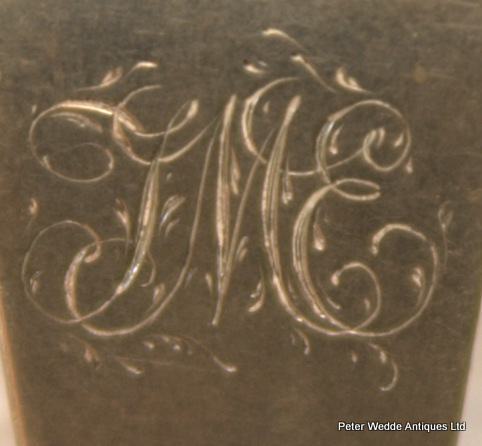 A George III Sterling Silver Bright Cut Teaspoon, Monogramed "MK." A Charming Australian Presentation Sterling Silver Boomerang Set With A Cabochon Opal With Inscription Of Highland Dancing Interest, Dated 1954. 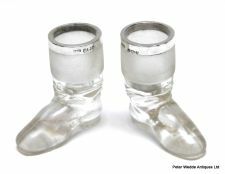 A Pair Of Late Victorian Novelty Glass Vesta Holders Modelled As Boots, Each With Applied Sterling Silver Rim. 60mm Wide x 66mm High. 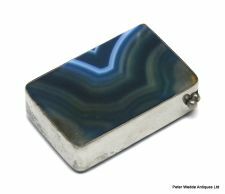 An Edwardian Plated Agate Vesta Case With Hinged Striker And Suspension Ring. 40mm Wide x 27mm Deep. A Good Looking George VI Georgian Style Sauce Boat With Shaped Rim, Acanthus Capped Double Scroll Handle And Pad Feet With Shell Terminals. 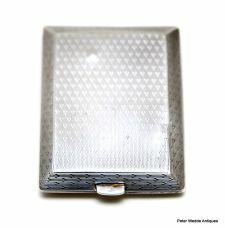 Top London Silversmith, Clear Marks, Excellent Condition. A Pair Of George III Sterling Silver Sugar Nips With Scallop Shape Bowls. Both Bowls Hallmarked - One With Lion Passant And One With The Makers Mark "IB"? Not Traced. 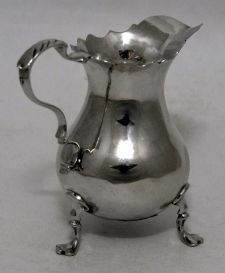 A Regency Sterling Silver Squat Cream Jug With Gadrooned Rim, Acanthus Capped Scroll Handle And Squat Circular Feet. Couple Of Small Dings, Otherwise Good Condition. A George III Sterling Silver Old English Pattern Basting Spoon With An Engraved Crest Of A Man Wearing A Turban. A William IV Sterling Silver Double Struck Kings Pattern Basting Spoon Of Good Gauge And Weight. A Superb Early 19thC French Silver Niello Waisted Rectangular Snuff Box The Cover Deocrated With 2 Equestrian Combatants, The Sides And Base With Fruiting Vine. The Inside Cover Marked For Mention Et Wagner, Paris 1832-38, Together With An Inscription "To Charles Innes From A Valued Friend 1837." The Rim With Further Guarantee And Makers Marks. Lovely Well Patinated Original Condition. Mention & Wagner Were Noted Paiisienne Silvesmiths Of The Period Known Particulary For Their Niello Work. He insculated his first hallmark in 1810 and established himself as a jewelry manufacturer, his production consists of earrings, necklaces, pins, rings, bracelets, padlocks, pendants, keys, cachets, beads, coral, brilliants, silver and gold. He also proposed the implementation of Freemasonry orders and the export of gemstones. From 1829 to 1841, he worked with goldsmith Charles Wagner to develop a niello manufacturing process. After that date he continued to work as a jeweler in fine stones. A Tiny Ding To The Bottom Of One Side, Otherwise Good Condition. 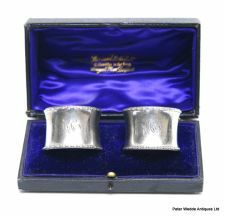 An Excellent Pair Of Edwardian Sterling Silver Shaped Napkin Rings With Pierced And Engraved Scrollwork. 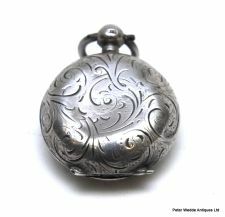 An Edwardian Circular Sterling Silver Sovereign Case Engraved With Scollwork. Weight : 20 Grams All In. A Few Small Dings, Nice Crisp Action. A George III Sterling Silver Sifter Berry Ladle Converted In Victorian Times To A Berry Sifter Ladle, The Bowl Gilded. William Eley & William Fearn. 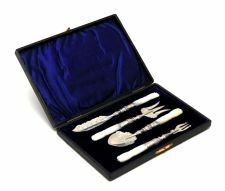 A Cased Edwardian Sterling Silver 4 Piece Serving Set With Carved Mother-Of-Pearl Handles And Engraved Work Comprising Of A Pickle Fork, Jam Spoon, Bread Fork And Butter Knife. The Cutlery In Excellent Condition, The Case Distressed. 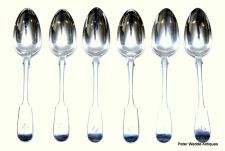 6 x dessert spoons, 5 x soup spoons, 5 x teaspoons. One Table Fork And Two Dessert Forks With Different Armorial - I Can Guarantee Not One Of Your Guests Will Notice The Differnce Between The Upright Lion And The Upright Eagle, Backs Of Soup Spoons, Teaspoons, Table Forks And Dessert Forks With Small Amounts Of Wear And Nickle Exposure, Back Of Dessert Spoons A Little More Worn - One With More So. 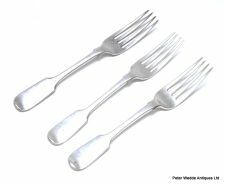 Get The Look For A Fraction Of The Price Of Sterling, Good Looking Stylish Cutlery For A Very Modest Price, The Lion Crest Of Course Belonging To Your Distinguished Ancestors! 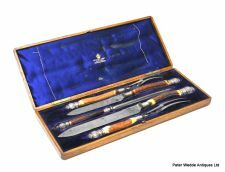 A Fabulous Set Of 12 19thC French Silver And Steel Table Knives, The Monogramed Fluted Silver Handles With Ribbon Tied Garlands, The Steel Blades Bearing Makers Mark For "Orfevrerie Boulenger Paris." The Handles With Minerva And Other Marks. Good Condition With To Be Expected Stains To The Steel Blades, The Case A Bit Distressed. With These, Beef A Joy! The house of goldsmiths was founded in 1810 in Paris under the name of Hautin, and continued by the nephew of the founder Adolphe Boulenger who gave it the name of "A. Boulenger & Cie", 4 rue du Vert Bois in Paris . After his death in 1898, his son Charles Boulenger succeeded him and the goldsmith's shop took the name of "Ch. Boulenger & Cie". Boulenger was a leading Parisian goldsmith during the nineteenth and early twentieth centuries , he was the main supplier of the silverware of the French Navy . The Plush Lined Case Bearing London Location. Excellent Condition. An Amusing Late Victorian Small Measuring Cup Modelled As A Monkey Supporting The Cup And Standing On A Domed Beaded Edge Base. Maker JD Not Traced, Tempting To Attribute To James Dixon But This Does Not Appear To Be On Of His Marks. 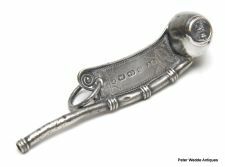 A Victorian Sterling Silver Bosuns Whistle Of Conventional Form With Suspension Ring, Fouled Anchor And Crown Motif And Foliate Engraving To The Blade. Pretty Good Condition, A Bit Of Wear And Commensurate With Age - Couple Of Dings to The Tube, Very Clear Marks. 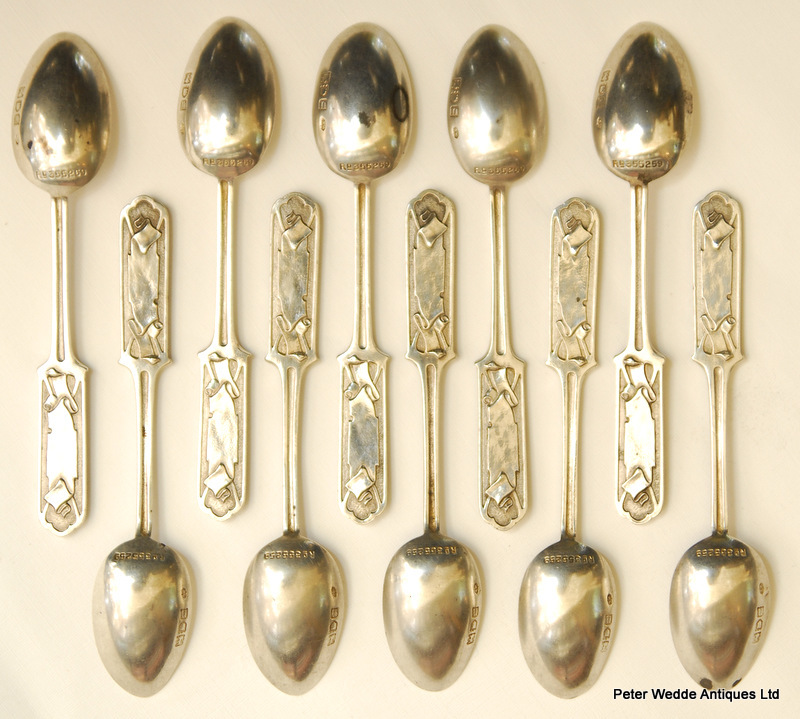 A Set Of 6 William IV Sterling Silver Fiddle Pattern Dessert Spoons, Monogramed "P."
A George III Sterling Silver Marrow Scoop. Excellent Condition With Good Clear Marks. The Bowl A Little Worn, Otherwise Good Condition. Date Mark Indecipherable, Circa 1765. Not Confident With These Marks, What Is Certain Is This Scoop Was Made In London In The Early Part Of The Second Half Of The 18th Century. 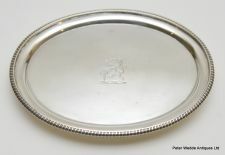 An Early George III Sterling Silver Card Tray With Cast Shell Pie Crust Rim And Raised Pad Feet; Contemporary Monogram "JNC."? Very Nice Original Condition, Good Patina, Clear Marks. A George IV Sterling Silver Cylindrical Mustard Pot With Domed Cover, Bud Finial, Shell Thumbpiece, Acanthus Capped And Reeded Handle And All Over Repousse Decoration Of Budding And Flowering Roses; Original Blue Glass Liner. Good Original Condition, Marks Clear. 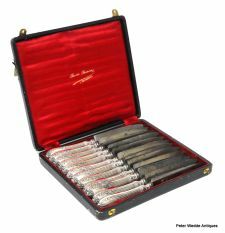 Virtually Impossible To Find : A Complete Set Of 12 George III Sterling Silver Table Knives And Entrée Knives With Sterling Silver Handles Decorated With Scrolls And Shells (Hourglass Pattern) And Steel Blades. In Good Well Used Condition, The Odd Ding, The Bear Armorial On The Table Knives Becoming Faint, The Steel Blades With The To Be Expected Marks. Very Stylish, Very Sharp, Very Functional. Made At The Famous Soho Workshops Of Mathew Boulton. Shortly After His Death In 1809. One Of England's Most Famous Industrialists Of The 18thC Boulton Counted Amongst His Chums Josiah Wedgwood, Erasmus Darwin And James Watt, With Whom He Produced Many Steam Engines, Making Possible The Mechanisation Of Factories And Mills. A George IV Scottish Sterling Silver Fiddle Pattern Fish Slice With Pierced And Engraved Work. A Stylish Victorian EPNS Ewer Of Bellarmine Inspiration With Loop Handle, Neck Cast With A Bearded Mask And Oviform Body On Raised Circular Foot. A Fabulous Edwardian EPNS Circular Chaffing Dish, The Domed Cover With Engraved Armorial, The Border With Cast Foliate Work, The Interior With Divider And With Turned Ivory Handle. A Cased Set Of 6 Sterling Silver Celtic Knot Teaspoons. Inspired By 5th Century Monk's Silver. 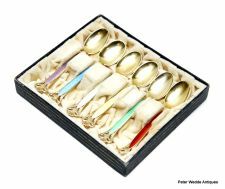 A Gorgeous Cased Set Of 6 Norwegian Sterling Silver And Enamel Teaspoons With Gilded Bowls And Pierced Terminals. Stamped "TH MARTHINSEN STERLING NORWAY." Tiny Enamel Loss To Two. 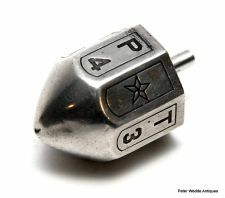 An Unusual Sterling Silver Gambling Faceted Octagonal Spinning Top Each Face With Various Numbers, Letters And Symbols; Stamped "Sterling" Together With Makers Mark "JB"?. A Superb Late Victorian Sterling Silver And Tortoiseshell Inkstand With Pierced Applied Rim Decorated With Classical Masks, Naked Putto And Winged Phoenix, Moulded Square Glass Inkwell With Hinged Cover, Pen Rest, Pen And Raised Scroll Feet. Goldsmiths & Silversmiths Co Ltd.
An Attractive Late Victorian Circular Sugar Bowl With Repousse Ornament Of Scrolling Foliage And Pierced Acanthus Capped Double Scroll Handles. Richard Martin & Ebenezer Hall-Martin. A Rare Edwardian Sterling Silver Tapering Cylindrical Posey Vase With Pierced Trellis And Rococo Scrollwork, The Scrollwork Cartouche Blank. 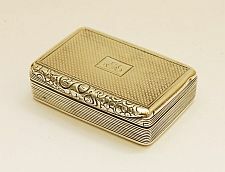 Nice Clear Hallmarks, Excellent Condition, A Perfect Gift For The Bride With Everything - She Will Not Have One Of These! 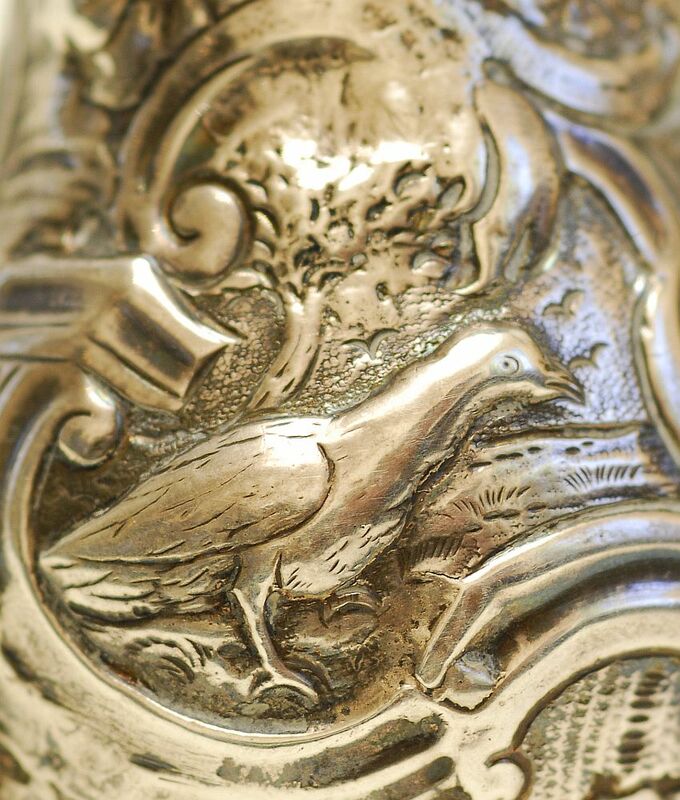 A Late Victorian Sterling Silver Nurses Buckle With Pierced Scots Thistle And Foliage. 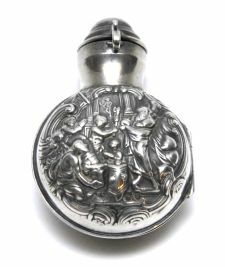 A Good Edwardian Double Hinged Sterling Silver Circular Case Repousse In High Relief With A Subject Of Biblical Inspiration, The Enclosed Circular Glass Scent Bottle With Sterling Silver Mounted Neck And Target Stopper. William Comyns & Sons Ltd. Weight : 48 Grams Case Only. Excellent Condition, The Case Lined With Cotton Wool. 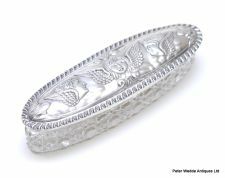 An Attractive Small Edwardian Sterling Silver Oval Caddy With Lift Off Cover And Engraved Ornament Of Ribbon Tied Musical Swags And Wreaths; Blank Cartouche. George Nathan & Ridley Hayes. 71mm Wide x 77mm High. 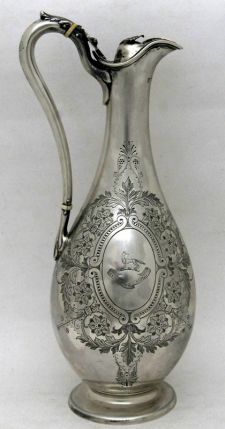 A Victorian Scottish Sterling Silver Ewer With High Acanthus Capped Double Scroll Handle, Hinged Cover, Slender Neck, Ovoid Body, Pedestal Foot And Circular Base, The Shoulder Repoussef With Classical Masks And Eagle Heads, One Cartouche Monogramed And Dated June 12th 1872, The Body With An Engraved Armorial Of A Boor And Cross. 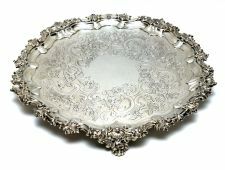 A Small George II Sterling Silver Waiter With Cast Shell And Pie Crust Rim, Centred By A Blank Lozenge Shape Cartouche Flanked By Foliate Scrolls. 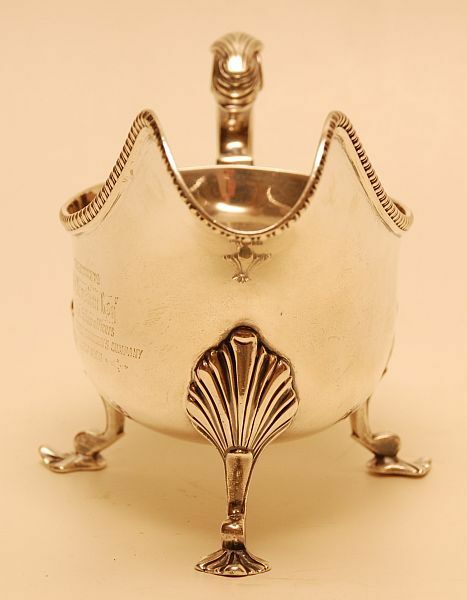 A George III Sterling Silver Waiter With Gadrooned Piecrust Rim And Stepped Pad Feet, The Centre Engraved With An Eagles Talon Armorial Device. Thomas Hannam & John Carter. 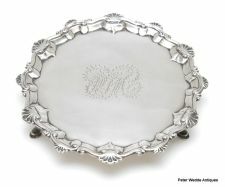 A William IV Scottish Sterling Silver Salver With Cast Foliate Rim And Scroll Feet, Engraved With Scrolling Foliage Around A Vacant Cartouche. 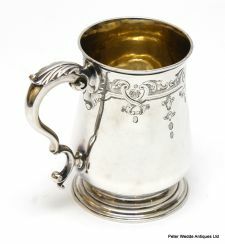 A George II Sterling Silver Baluster Cream Jug With Shaped Cut Rim, Acanthus Capped Double Scroll Handle And Raised Pad Feet; Owners Initials "CHI" Engraved To Base And "G" To Handle, One Foot Featuring Scratch Marks. 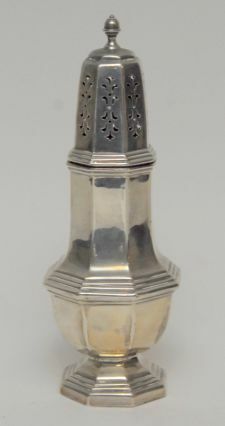 A 20thC Georgian Style Octagonal Vase Shape Caster With Finial, Pierced Cover And Stepped Octagonal Foot. Excellent Condition, Marked To Both Pieces. A Monumental Turn-Of-The-Century German, Dautzenberg, Pewter Art Nouveau Vase Designed By J Rob Hannig, With Pierced Foliate Handles And Relief Ornament Of Asymmetric Flowering Foliage And A Profile Bust Of An Art Nouveau Maiden With Flowing Hair. 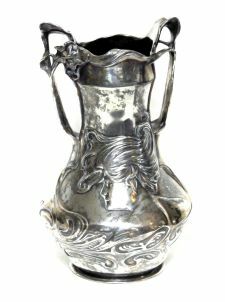 An Identical Vase Is Illustrated In, "20thC Pewter Art Nouveau To Modernism," Paul Carter Robinson, Page 102. 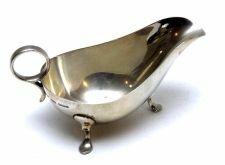 A 20thC Sterling Silver Plain Sauce Boat With Loop Handle And Pad Feet. Excellent Condition, Clear Marks, Not Lightweight. 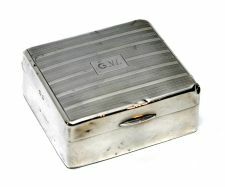 A George V Sterling Silver Small Square Rectangular Engine Turned Cedar Lined Table Cigarette Box; Monogramed GW. William Neal & Sons Ltd.
2 Corners Dinged, Otherwise OK Condition. 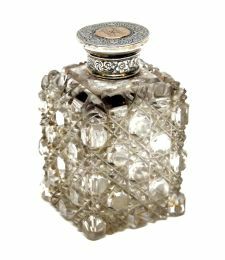 A Smart Victorian Deep Hobnail Cut Square Section Scent Bottle With Screw On Sterling Silver Cover With Inset Monogramed Gold Disc. 60mm Square x 100mm High. A Few Minor Extremity Nibbles, Otherwise Good Condition. 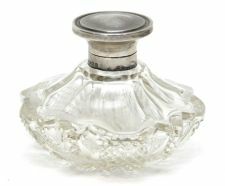 An Edwardian Faceted Rectangular Glass Scent Bottle With Screw On Cover. A Small George V Georgian Style Sterling Silver Baluster Cream Jug With Double Scroll Handle. 85mm High To Top Of Handle. 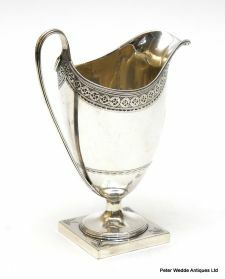 A Charming Small Proportion Victorian Sterling Silver Baluster Shape Ewer With Hinged Cover, Acanthus Capped Scroll Handle, Ivory Heat Rings, Parcel Gilt Interior, 2 Cartouches On Engraved Scrolling Foliage Ground, One With A Classically Draped Figure Carrying A Tray Of Heaped Fruit, Probably Emblematic Of Plenty, The Other With An Armorial Device Of A Fox And The Motto "Concussus Surgo - When Struck I Rise," Peculiarly Apt Sentiments For Wellingtonians At This Time. Richard Martin & Ebenezer Hall. The origin of the firm in the partnership established in 1820 in Sheffield by Henry Wilkinson and John Roberts who traded as Wilkinson & Roberts.The firm's chronology is: John Roberts (1836), Roberts & Hall ( 1846), Martin Hall & Co (1854), Martin Hall & Co Ltd (1866-1936). Martin Hall & Co was one of the best known British manufacturers and participated in many international exhibitions including the Crystal Palace 1851 Great Exhibition. 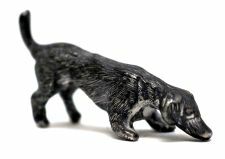 A Charming Tiny Cast Sterling Silver Hound. 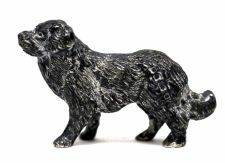 A Charming Miniature Cast Sterling Silver Spaniell. An Early 20thC George V Sterling Silver Cased Desk Clock With Swiss Clock, Oak Back With Easel And Shaped Case Monogramed "EB." A Set Of 6 George III Sterling Silver Old English Pattern Teaspoons; Monogramed EW. Peter, Ann & William Bateman. 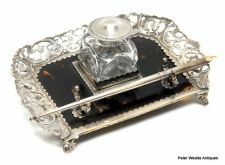 An Excellent Victorian Thick Walled Rectangular Glass Traveller's Inkwell With Star Cut Base And Engraved Sterling Silver Mount Featuring A Thread And Screw Hinged Cover; Monogramed. 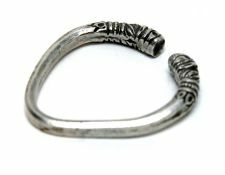 A Good Edwardian Sterling Silver Pierced Foliate Two Part Nurses Buckle. 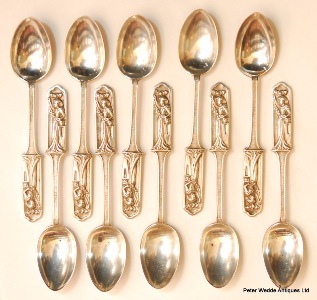 A Glorious Set Of 6 George III Scottish Sterling Silver Old English Pattern Soup Spoons; Monogramed "BKL." 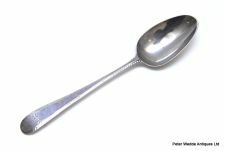 Excellent Condition, These Days Often Used As Serving Spoons. A Tall Edwardian Faceted Glass Dressing Table Jar With Hammered Sterling Silver Slip On Cover; Monogrammed "CC." 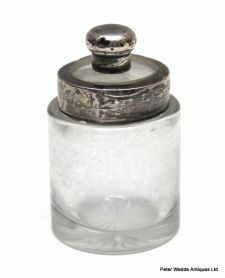 An Edwardian Faceted Glass Dressing Table Jar With Hammered Sterling Silver Slip On Cover; Monogrammed "CC." 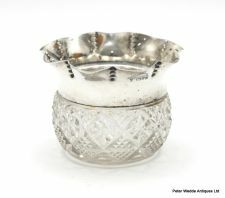 An Edwardian Cut Crystal Squat Oviform Bowl With Wide Shaped Sterling Silver Rim. George Nathan And Ridley Hayes. 103mm Diameter x 85mm High. 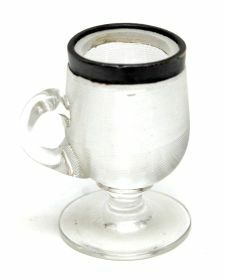 An Edwardian Ribbed Glass Vesta Of Custard Cup Shape With Sterling Silver Rim. 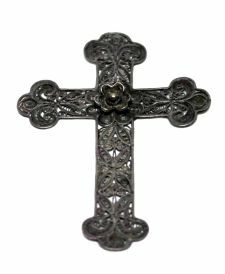 A Good Early 20thC Leaf And Scroll Filigree Silver Cross With Single Applied Flower Head. A Small Ethnic Weighty Silver Amulet Of Unknown Origin. 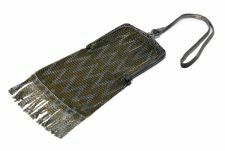 A Stylish 1930's EPNS Ladie's Mesh Evening Purse With Gold And Silver Coloured Zig-Zag Mesh, Entwined Silver Strap And Blue Cabochon Clasp; Stamped "EPNS." The Mesh Becoming Slilghtly Loose At The Mount. A George V Early 20thC Small Sterling Silver Brush. Evidence Of Old Solder Repair To Base. 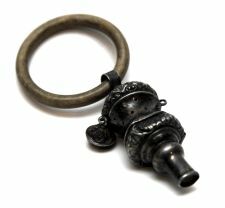 An Edwardian Sterling Silver Babies Rattle Formed As A Whistle With Rattles; Composition Teething Ring. Well Used Damaged Conditon, Lacks One Bell, Lacks Teether. A Good Edwardian Engraved And Pierced Sterling Silver Foliate Nurses Two Section Buckle. 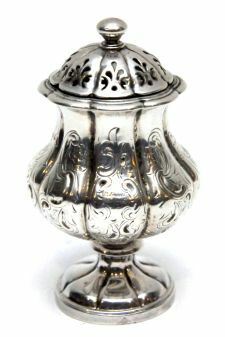 A Victorian Sterling Silver Ponce Pot With Finial, Pierced Domed Cover, Engraved Baluster Body, Pedestal And Circular Base. 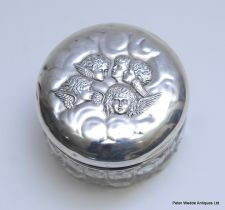 A 19thC Dutch Silver Hinged Oval Snuff Box, The Cover Repousse With A Naked Figure Emblematic Of Fecundity Surrounded By Naked Figures, The Sides With Alternating Panels Of A Pipe Smoker And A Putto. 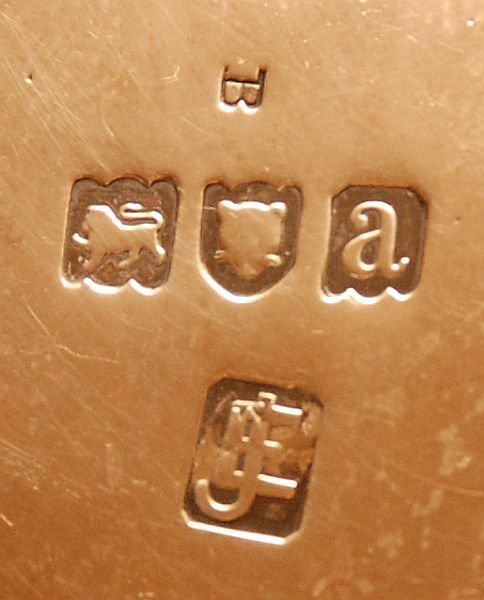 Extensive Dutch Hallmarks Together With Further English Import Marks For Sheffield 1898. 60mm Wide x 55mm Deep x 39mm High. 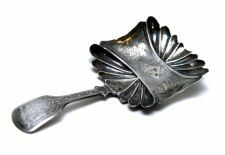 A Good Victorian Provincial Sterling Silver Long Caddy Spoon With Scallop Shape Bowl. 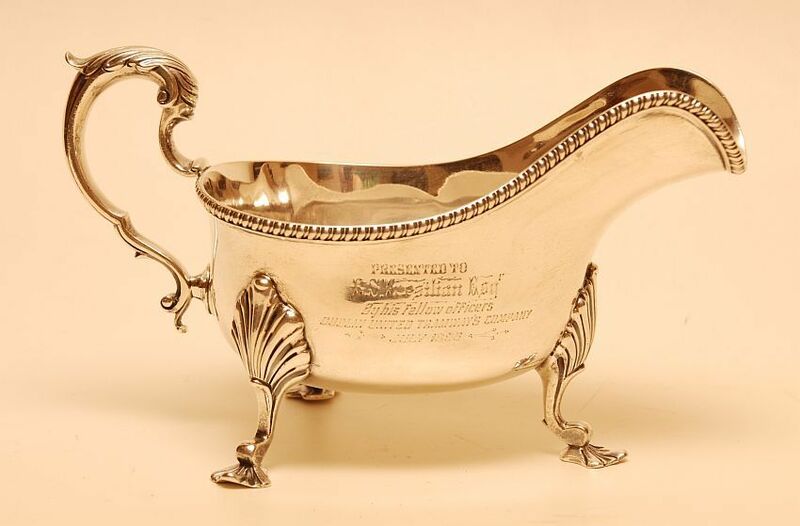 A Good George IV Sterling Silver Caddy Spoon With Rectangular Scalloped Bowl Prick Engraved With Lozenge And Foliate Work, The Fiddle Handle Further Engraved. A Good George III Scottish Sterling Silver Long Caddy Spoon With Engraved Shovel Shape Bowl And Plain Handle Monogramed "A." 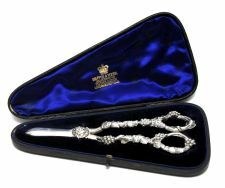 A Very Good Quality Cased Pair Of Weighty Cast Sterling Silver Grape Scissors Decorated In High Relief With Fruiting Vine. The Case Marked For Mappin & Webb. 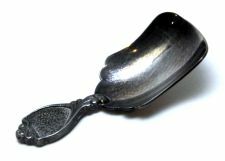 A 20thC EPNS Caddy Spoon With Plain Bowl And Scroll Terminal. An Attractive Pair Of Victorian Sterling Silver Oval Octafoil Bon Bon Dishes With High Relief Ornament Of Flowering Foliage. Both Marked On The Rim With Retailers Marks For "Hardy Bros Sydney." Total Weight : 203 Grams. 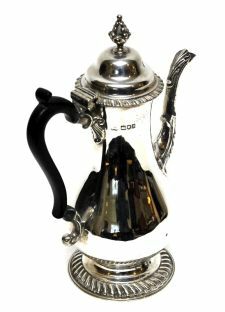 A Handsome Edwardian Georgian Style Sterling Silver Coffee Pot With Finial, Gardrooned Edges, Acanthus Capped Spout And Ebony Double Scroll Handle. A Brilliant Pair Of Sterling Silver Old English Basting Spoons, Monogramed GJM. An Exceptional Pair In Immaculate Condition - Look At The Bowl Tips, Not An Iota Of Wear After 210 Years! 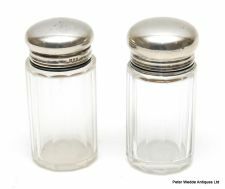 These Are Great For Buffet Style Meals - One For The Curry And One For The Rice. 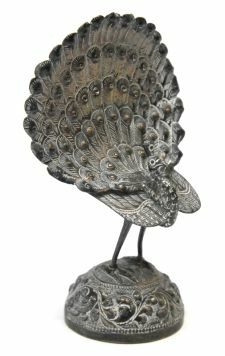 A Decorative Eastern Silver Menu Holder Modelled As A Peacock On Domed Base. 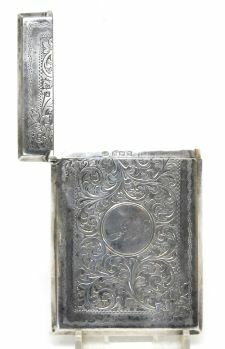 A Good Victorian Sterling Silver Hinged Rectangular Card Case With All Over Scrolling Foliage, Circular Cartouche Monogramed "JN." Good Colour, Good Marks, The Reverse With Dings. 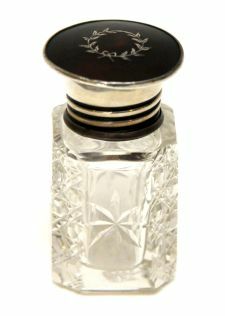 An Edwardian Cut Crystal Smelling Salts Bottle And Original Stopper, The Screw On Sterling Silver Cover With Scrolling Foliage; Retains Original Salts. The Bottle In Excellent Condition, The Cover With A Few Minor Wrinkles. 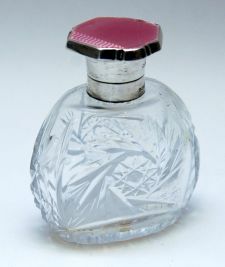 A Stylish George V Sterling Silver And Pink Enamel Scent Bottle With Hinged Cover, Original Stopper, Engine Turning, Bevelled Edge And Cut Crystal Flattened Oviform Body. 102mm High x 87mm Wide. A George V Sterling Silver And Tortoiseshell Hand Mirror With Inlaid Piquet Scrolling Harebell Ornament, Stamped "Guaranteed Tortoiseshell." 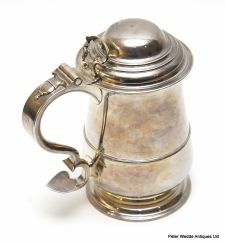 An Excellent George III Sterling Silver Helmet Shape Cream Jug With Reeded Rim, Strap Handle, A Band Of Bright Cut Acorn Leaf Engraving And Engraved Monograme Within A Leaf Garland Cartouche. 99mm High To Top Of Handle. 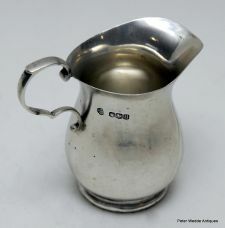 Excellent Conditon, Nice Clear Hallmarks Under The Spout, The Most Satisfying Cream Jug Shape Of Them All And By A Top London Maker. What More Could One Want? 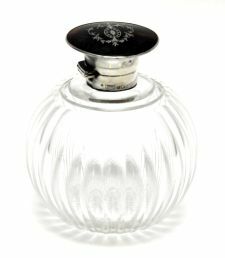 A George V Sterling Silver And Tortoiseshell Smelling Salts Bottle With Screw Cover, Original Stopper And Inlaid Piquet Ribbon Tied Harebell Wreath. Stamped Retailers Marks "Lund London EC." A Good Early 20thC Spire Shape Cut Crystal Scent Bottle And Stopper With Wide Sterling Silver Collar And Faceted Hexagonal Stopper. 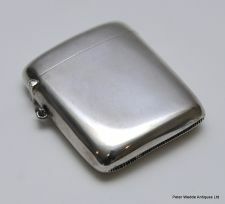 S Blankansee & Sons Ltd.
A Victorian Sterling Silver Narrow Hip Flask With Bayonet Fitting. 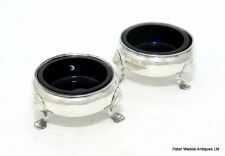 A Small Pair Of Monogrammed Sterling Silver Circular Ashtrays. 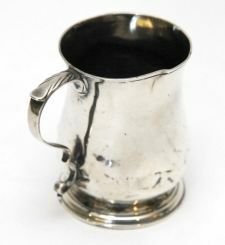 A Rare Small George III Sterling Silver Baluster Mug With Rolled Edge And Acanthus Capped Double Scroll Handle. Quite A Few Dings, Pierced At The Bottom Of The Handle. To H Pennington Esq 1911." Excellent Condition, Good Crisp Clasp, Lacks Internal Ribbon. 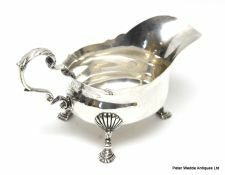 A Good Victorian Sterling Silver Circular Waiter With Shaped Piecrust Edge With Cast Scrolling Foliage, Engraved Scrolling Foliage, Engraved Armorial Of An Arm With A Dagger And Motto 'Virtute Et Numine" - "By Valour And Divine Aid," And Cast Scroll Feet. Charles T Fox & George Fox. A Good Quality Queen Elizabeth II Sterling Silver Nurses Buckle Cast With Maskes And Naked Putti Amongst Pierced Scrollwork. Quite Weighty At 79 Grams. 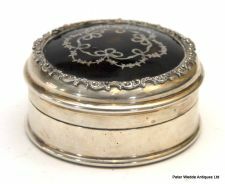 A Good Edwardian Asprey Sterling Silver Circular Dressing Table Box With Piquet Work Tortoiseshell Cover. London 1910 With Engraved Asprey Mark. 65mm Diameter x 32mm High. A George III Sterling Silver Old English Pattern Basting Spoon With Engraved Monogram. The bowl a little worn. 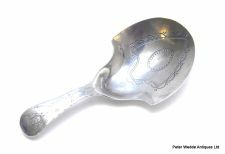 A Good William IV Sterling Silver Fiddle Pattern Basting Spoon With Engraved Armorial. A Gorgeous George III Sterling Silver Feather Edge Old English Basting Spoon; Monogrammed And Dated 1793; Bottom Marked. An Early Victorian Sterling Silver Fiddle Thread And Shell Basting Spoon With Engraved Bird Armorial. At 200 Grams Heavy Gauge. A Fabulous Serving Spoon In Excellent Condition. 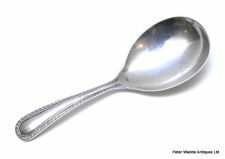 An 18thC George III Sterling Silver Old English Pattern Basting Spoon. Critical consideration - state of bowl - excellent. 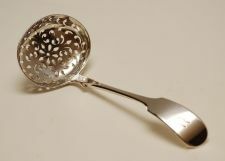 A William IV Sterling Silver Fiddle Pattern Basting Spoon, monogrammed "JM" "B." Adey Joseph II & Albert Savory. 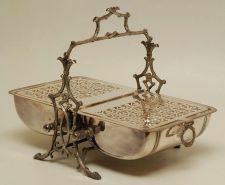 A Fine Pair Of William IV Sterling Silver Oblong Entrée Dishes And Covers With Gadrooned Borders, Canted Corners, Raised Flat Topped Cushion Covers With Bayonet Fittings And Leaf And Scroll Handles On Matching Shaped Gadroon Mounted Grounds; Each Cover Engraved Once With Initials And Coronet. 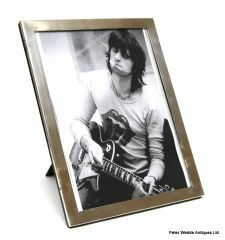 Dimensions : 11 ½ x 8 5/8Inches; 284mm x 220mm. Garrard Insurance Valuation For 10,200 Sterling, Dated 5 October, 2005. 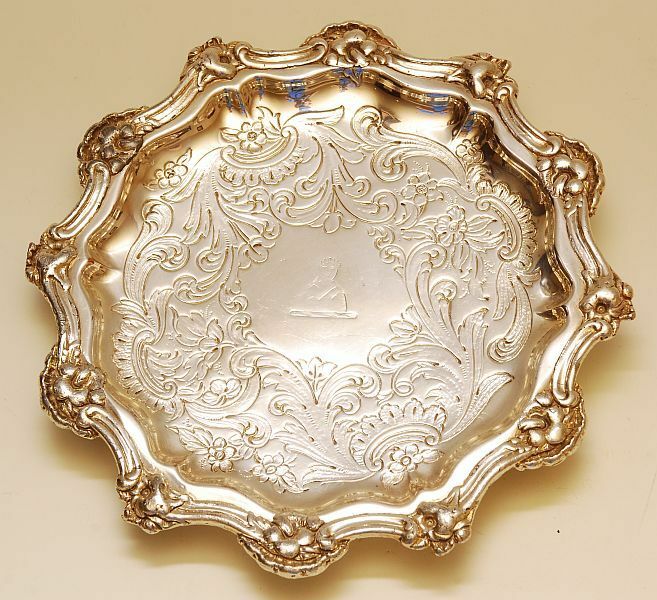 A Fine George III Sterling Silver Oval Meat Dish With Gadrooned Border, Engraved Coat Of Arms, Quartered Shield, Supporters, Coronet And Motto “Sero Sed Serio,” – Slow But Sure Together With An Engraved Badge Of The Most Ancient And Most Noble Order Of The Thistle. Makers Mark Rubbed, Possibly William Burwash Or William Sloane. The Full Armorial Bearings – Quartered Shield, Supporters, Coronet Of A Marquess And Motto “Sero Sed Serio” – Slow But Sure, As Borne By The Marquesses Of Lothian. The Shield Is Quartered, The First And Fourth Quarters Being For The Lothian Peerage And The Second And Third For The Lordship Of Jedburgh, Created 1622. The Badge Of The Most Ancient And Most Noble Order Of The Thistle i.e. A Representation Of St Andrew Holding His Cross Within An Oval Band Inscribed With The Order’s Motto “Nemo Me Impune Lacesset (sic – Should Read “Lacessit”) – No One Provokes Me With Impunity. The Badge Is Incorporated Into The Design Of Several Military Badges. This Dish Is Contemporary With William John Kerr, 5th Marquess Of Lothian Who Was Born On 13 March 1737. He Succeeded To The Marquessate On 12 April 1775, Was Appointed A Knight Of The Order Of The Thistle On 11 October 1776, Served As A Representative Peer 1778-1790, General In The Army And Colonel Of The 11th Dragoons. He Married On 15 July 1762 Elizabeth (Died 1780) Only Daughter Of Chichester Fortescue, Of Dromisken, County Louth, And A Granddaughter Of Richard Wesley (Wellesley), 1st Lord Mornington (1735-1758) And A Cousin Of Arthur Wellesley Who Later Became The First Duke Of Wellington (1769-1852). He Died On 4 January 1815. His Third Son Was Vice-Admiral Lord Mark Robert Kerr (1776-1840) Who On 18 July 1799 Married Charlotte, Countess Of Antrim In Her Own Right (1779-1835). 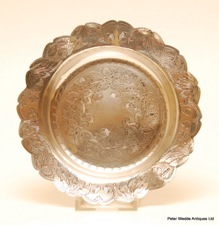 This Dish May Have Been A Wedding Gift To Lord Mark And The Countess Of Antrim. Robert Garrard For R&S Garrard & Co. Weight : 36 Ounces, 1120 Grams. The Full Armorial Bearings (Shield, Supporters, Baron’s Coronet And Motto “Virtus In Arduis, Courage In Difficulties, As Borne By The Baring Family Created Baron Ashburton, Of Ashburton, Devon, On 10 April, 1835. Francis Baring, 3rd Baron (1800-1868) Succeeded To The Title On 23 March 1864. He Had Previously Served As The MP For Thetford. He Died On 6 September 1868 And His Eldest Son Alexander Hugh Succeeded As 4th Baron. Alexander Hugh Baring, Born 1835, Was A MA, DL And Served As A MP For Thetford 1857-67. He Died On 18 July 1889. On 5 January 1864 He Married Leonora Caroline, Second Daughter Of Edward St Vincent, 9th Lord Digby. This Meat Dish May Have Been An 1864 Wedding Gift From The 3rd Lord Ashburton To His Heir. Garrard Insurance Valuation For 5,000 Sterling, Dated 5 October, 2005. The Crest Is Borne By A Number Of Families Of Hamilton, Including The Dukes Of Hamilton And Brandon, And Of Abercorn, And Other Titled Families. Without Other Supporting Evidence It Is Impossible To Identify The Specific Owner Of This Crest. Garrard Insurance Valuation For 9,500 Sterling, Dated 5 October, 2005. Total Number, Excluding Knives, 86 Pieces. The Whole In Edwardian Walker & Hall Mahogany Box With Vacant Brass Escutcheon, Heavy Duty Military Style Brass Recessed Handles, Brass Piano Style Hinges, 2 Panel Doors And 4 Drawers 3 Of Which Are Fitted; Inset Walker & Hall Brass Plaque. 530 Wide x 400mm Deep x 348mm High. "Herbert Evelyn Curtis From Alfred Fell." A superb mug with significant Nelson interest. A Highly Decorative Pair Of Victorian EPNS Goblets With Waisted Bulbous Bowls, Tall Stems And Domed Circular Feet. Stamped Makers Marks For Thomas Latham & Ernest Morton. An Early 20thC Sterling Silver Mounted Glass Claret Jug Of Christopher Dresser Inspiration With Hinged Cover, Pronounced Spout, Wide Collar And Plain Handle. 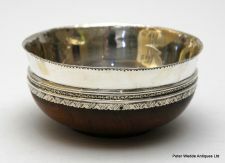 An Early 20thC Chinese Sterling Silver Circular Bowl With Shaped Rim, Capped Double Scroll Handles, Applied Foliage And Domed Circular Foot. 151mm Across The Handles x 103mm Diameter x 79mm High To Top Of Handle x 63mm High To Top Of Bowl. Stamped "Wing On Co Shanghai" Together With Chinese Character Mark. An Excellent George IV 4 Piece Sterling Silver Melon Shape Tea And Coffee Service With Domed Covers, Melon Finials, Acanthus Capped Handles, Ivory Heat Rings, Leaf And Lobed Bodies And Raised Scroll Feet. Edward I, Edward II, John L & William Barnard. Teapot - 719 Grams, Coffee Pot 944 Grams, Sugar Bowl 369 Grams, Jug 261 Grams. At This Price Very Good Buying Indeed. 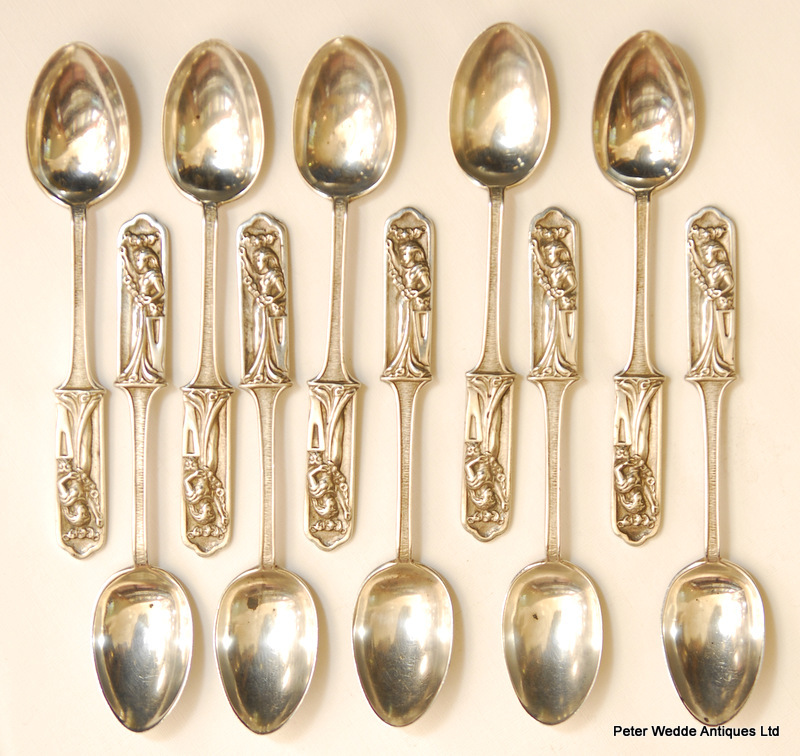 A Good Pair Of George III Sterling Silver Monogrammed Soup Spoons. Samuel Godbehere & Edward Wigan. Good Weight, Excellent Condition, Interesting Little Flourish To The Terminal. A Pair Of Early Victorian Sterling Silver Queen's Pattern Salt Spoons, Monogrammed "G."
A George III Bottom Marked Sterling Silver Soup Spoon, Monogrammed "JA" Front And "A I A" The Reverse..
A George III Sterling Silver Old English Soup Spoon. The Bowl Worn But Still Functional As A Serving Spoon. 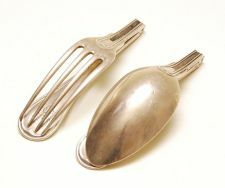 A Good Pair Of George III Sterling Silver Monogramed Soup Spoons. 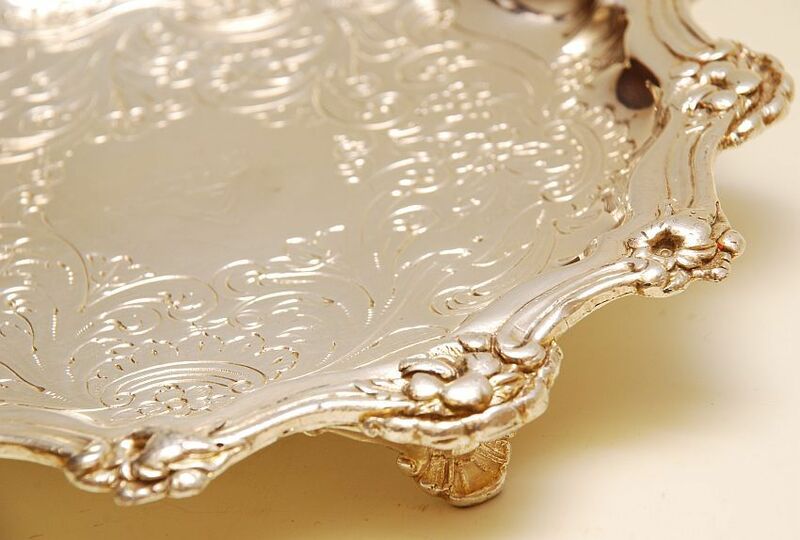 An Edwardian Sterling Silver Shell Shape Hors d'oeuvres Dish On Ball Feet. Good Condition, Marks A Bit Rubbed. A Set Of 6 George V Britannia Standard Lace Back Rat Tail Teaspoons. A Rare Pair Of Early 19thC Anglo Indian Rectangular Sterling Silver Salts And Matching Queens Pattern Spoons, The Salts With Applied Cast Edges, Gilded Interiors, Gadrooned Lower Halves, Raised Ball Feet And Engraved Armorials Of Stags. 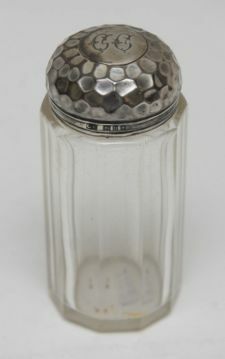 The Salts Stamped GG With Thistle, Ths Spoons Stamped G&Co. For George Gordon & Co., Madras. 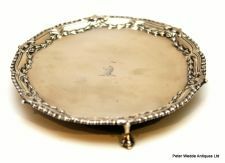 Here's A Cute Little Item For The Nelsonians - A Small Circular Nelson Made Sterling Silver Dish With Everted Rim, The Reverse Engraved "JHC & MEC Silver Wedding November 12th 1980." Stamped " L Kerr Stg Silver." 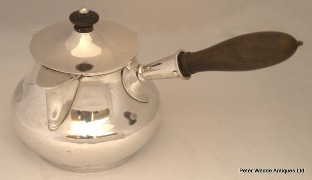 Lous Kerr Was A Nelson Silversmith Active For Most Of The 20thC. A Set Of 6 Australian Sterling Silver Tea Spoons. A Sterling Silver Exmouth Medal On Suspension Ring. A George V Tortoiseshell Paper Knife With Sterling Silver Mount Incorporating A Magnifying Glass. Asprey & Co., A Top Bond Street London Store. A Pair Of Late Victorian Sterling Silver Shell Shape Hors D'oeuvres Dishes. A George 1V sterling silver decanter label for Madeira. A Sterling Silver Port Decanter Label With Foliate Edge. 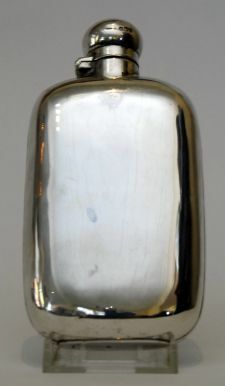 A Plain Vermouth Sterling Silver Decanter Label. A Victorian Sterling Silver Fiddle Pattern Mustard Spoon; Monogramed. A Sterling Silver Capstan Shape Inkwell With Wood Base. A George IV Sterling Silver Fruit Knife With Notched Mother-Of-Pearl Handle, The Name Plate Monogramed. 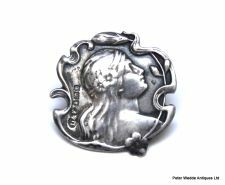 A Stylish Victorian Sterling Silver Belt Buckle Fashioned As A Series Of Roman Style Coins. An Interesting Early Victorian Sterling Silver Archery Presentation Medal With Engraved Inscription Dated 1839. 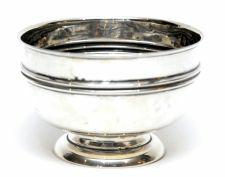 A 17th century style American sterling silver bleeding bowl with pierced handle and presentation dated 1906. Stamped American hallmarks to underside of handle. A good weight; useful for hors d'oeuvres or after dinner mints. 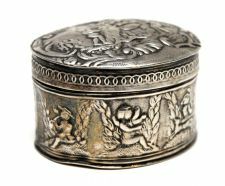 A 19thC Indian Rectangular Silver Hinged Snuff Box Decorated In Relief With Figures In Yogi Like Positions. 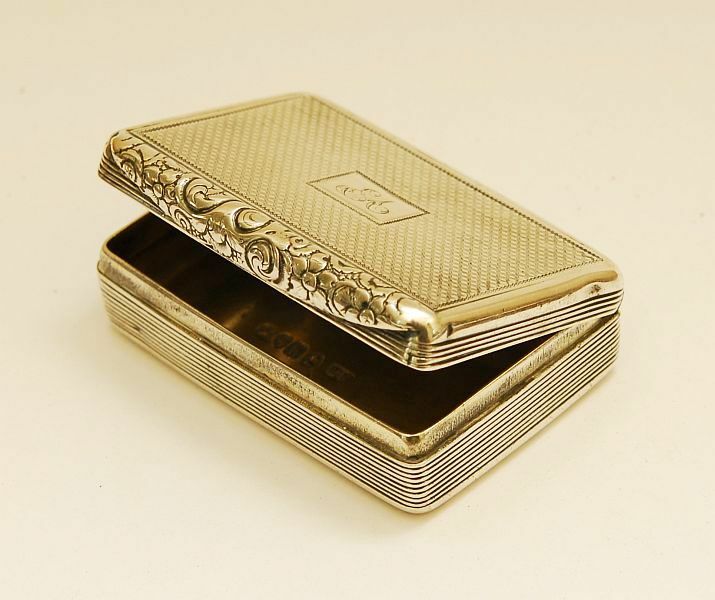 A Small George III Sterling Silver Hip Shape Hinged Snuff Box With Gilded Interior. Nice flush hinge with crisp action. Flat Covers With Finials And Oviform Bodys Decorated In Relief With Signs Of The Zodiac. 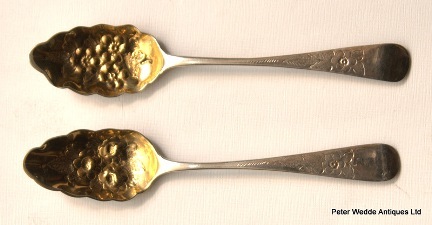 A Pair Of George III Sterling Silver Teaspoons, Converted And Gilded In Victorian Times To Form Berry Spoons. Several Candidates For The Makers Mark Of WW. A Decorative Set Of 8 Edwardian Sterling Silver Teaspoons With Die Struck Handles Featuring A Lady In A Long Gown Clutching A Floral Garland, The Reverse With An Unfurled Banner. A Late Victorian Sterling Silver Cream Jug And Sugar Bowl Set With Plain Reeded Handles And Fluted Lower Halves. J Millward Banks & Co. The Sugar Bowl 134mm Wide Across The Handles. An Edwardian Ribbed Glass Match Holder With Sterling Silver Top. A Cased Set Of 6 Sterling Silver Cake Forks, Probably Australian. Stamped STG SILVER and APW. 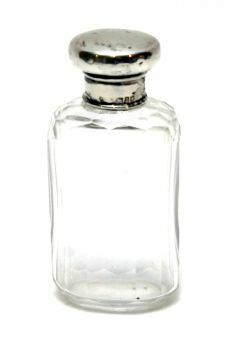 An Unusual Victorian Tall Cylindrical Cut Glass Patent Sauce Bottle With Sterling Silver Hinged Domed Cover With Glass Stopper And Scroll Handle. A Stylish EPNS Art Nouveau 2 Section Belt Buckle Set With Turquoise Glass Cabochons. Small Chip To One Cabochon. A Charming Set Of 3 George V Sterling Silver And Mother-Of-Pearl Small Knives And Forks. Excellent Condition. $80 per pair or $200 the lot. A Set Of 6 Victorian Sterling Silver Fiddle Pattern Monogrammed Dessert Forks. 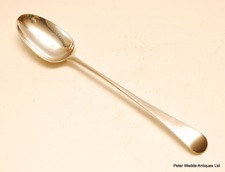 A Slender Early 20thC Sterling Silver Old English Pattern Salt Spoon. 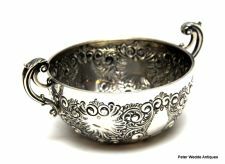 A Massive 19thC Scottish Sterling Silver Quaich Of Typical Form With Engraved Lug Handles, Stave Sides, Bands Of Scrollwork And Raised Foot. Presentation Inscription Of Highland Dancing Interest. 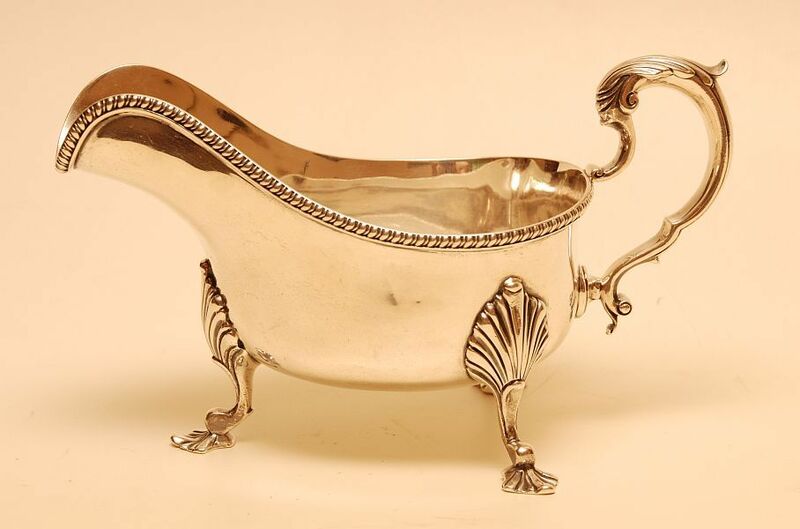 A Victorian Sterling Silver Kings Pattern Sifter Ladle With Gilded Bowl. William Gibson & John Langman. An impressive George V sterling silver bollard shape inkwell awarded to "Diane, Royal Yacht Squadron, 1932," with Benzie, Cowes, retailers mark; ceramic liner. 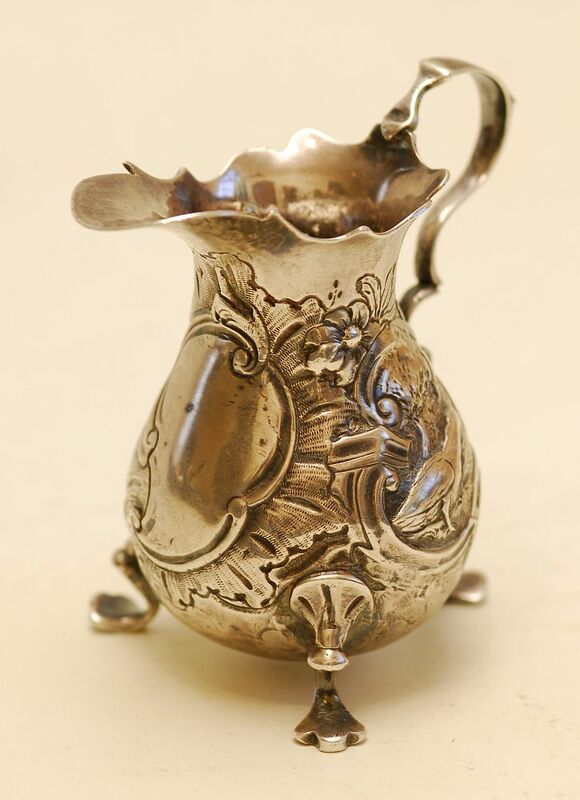 A George III Sterling Silver Pear Shape Cream Jug With Punched Borders And Acanthus Capped Double Scroll Handle. 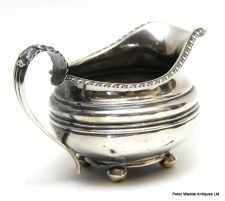 A George III Early 19th Century Sterling Silver Rectangular Cream Jug With Acanthus Capped Handle, Generous Spout, Fluted Body And Ball Feet. 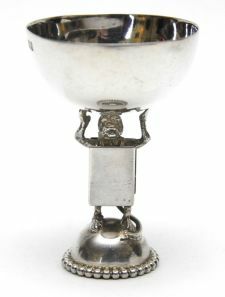 A Gorgeous William 1V Sterling Silver Goblet With Monogramed Parcel Gilt Bowl, Plain Stem And Domed Circular Foot. Hawksworth Eyre & Co Ltd.
A George III Sterling Silver And Composition Serving Trowel; monogrammed. A 19th Century Silver Two Prong Fork With Long Turned Ebony Handle. 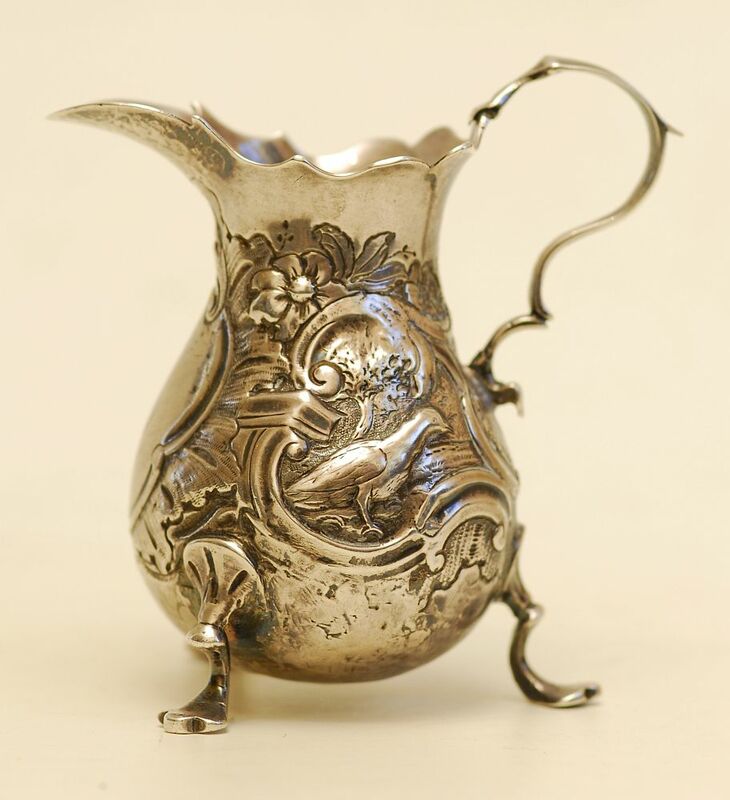 A Mid 18th Century Sterling Silver Baluster Cream Jug With Double Scroll Handle And Chased Decoration Of Birds, Rococco Scrollwork And Vacant Rococco Cartouche. 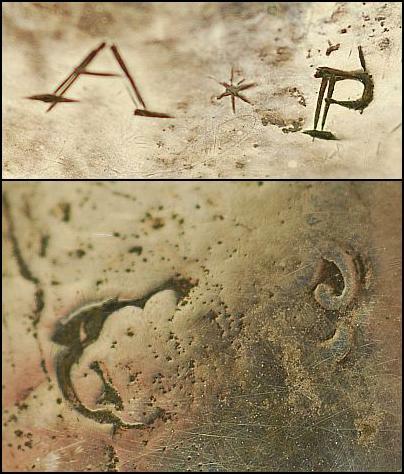 Engraved Owners Initials For "AP." 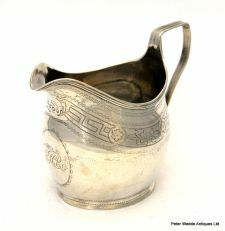 A small Sterling Silver cream jug elaborately embossed. 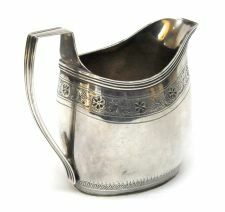 A Georgian style sterling silver baluster cream jug with acanthus capped handle and pad feet. 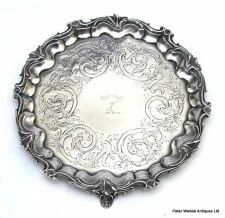 An Attractive Late Victorian Sterling Silver Circular Dish engraved with fruiting foliage; scalloped rim and ball feet. A Late Victorian EPNS Tea Caddy With Hinged Cover And Vacant Engraved Shield Shape Cartouche. An Excellent Pair Of Regency Sheffield Plate Shaped Rectangular Entrée Dishes With Cast Detachable Handles, Rolled Edges And Gadrooned Rims. A large and very handsome Electro Plated fiddle pattern ladle. 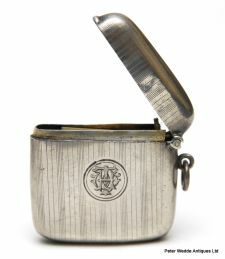 A George IV Sterling Silver Rectangular Engine Turned Snuff Box With Applied Cast Rim; Monogrammed "EA." A Most Interesting Cased Sterling Silver Mounted Ebony Baton Inscribed "To Brother HF Davie From Dunedin Orphans Club 25/5/15." 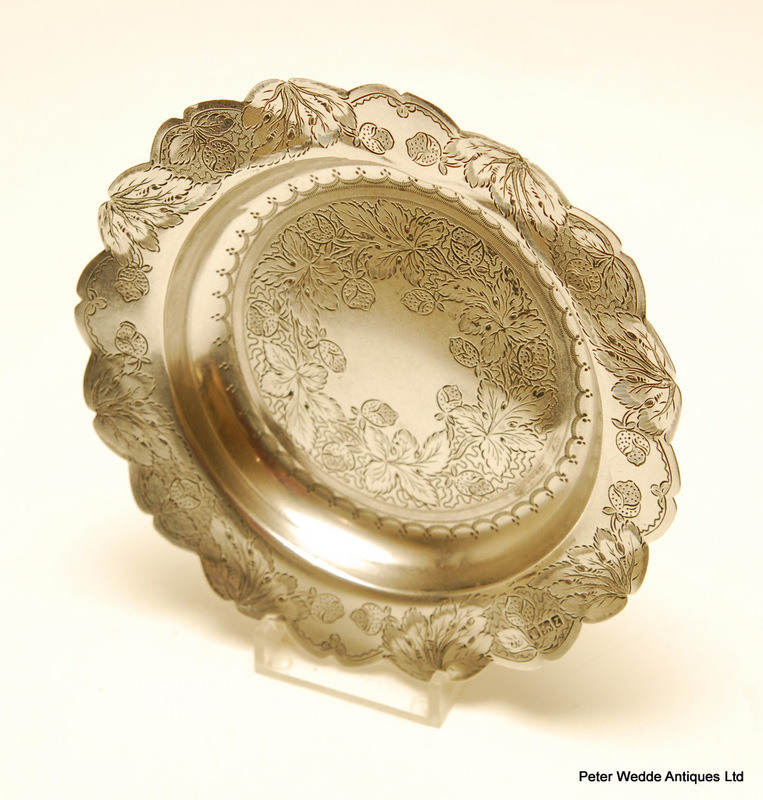 A small early 19th century Sheffield Plate card tray with shaped rim, engraved scrollwork, engraved armorial and raised feet. 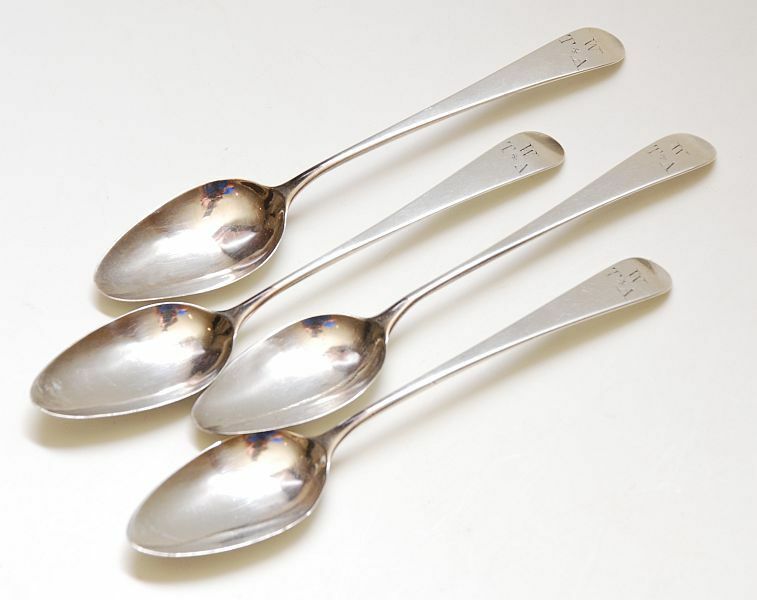 A nice set of 4 George III sterling silver Old English teaspoons; monogrammed "WTA." A pair of early 19thC Continental silver campaign folding spoon & fork set. 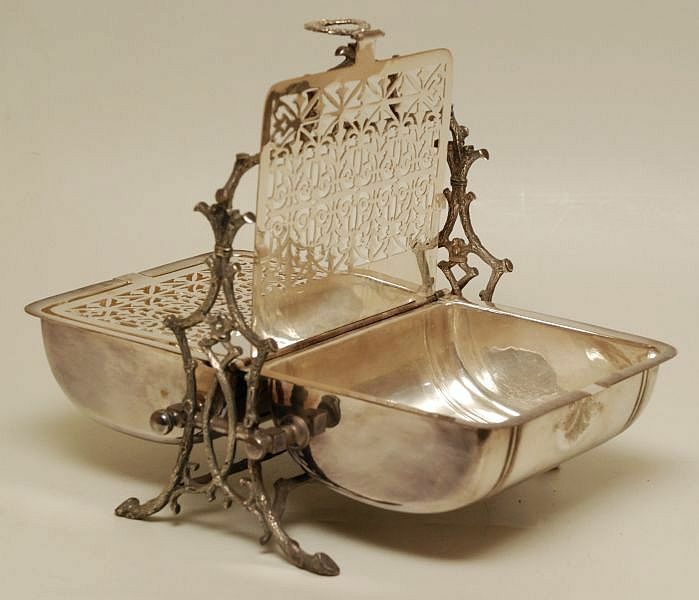 A Good Quality Late Victorian Georgian Style Sterling Silver Sauceboat With Gadrooned Rim, Double Scroll Handle And Cast Shell Feet; interesting inscription of Dublin interest. 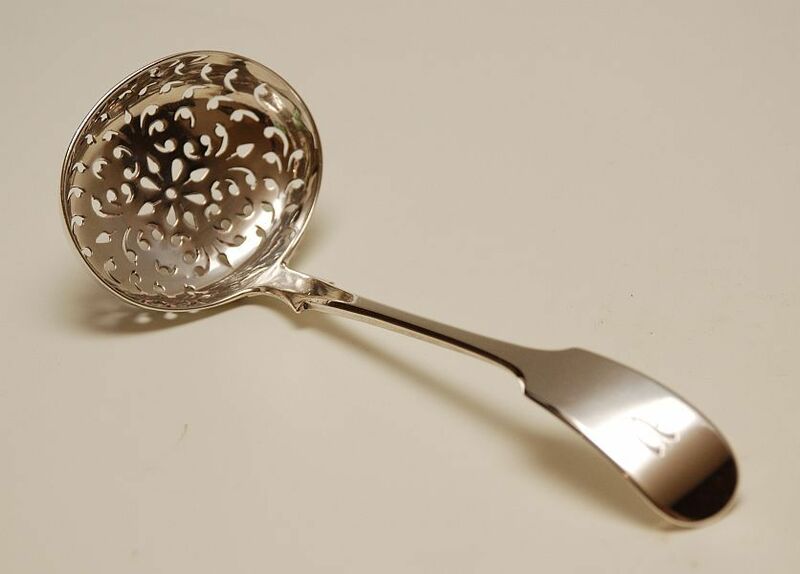 A Victorian Sterling Silver Fiddle Pattern Sifter Ladle. 205mm wide by 235mm high.